It’s a cookie party in the Ate by Ate kitchen! You all know how much I love baking cookies (and how much I love eating them! ), but these days, I love baking them even more than usual because it gives me a renewed sense of joy and purpose: I bake cookies to make my grandma and grandpa happy. I’m lucky to still have my grandpa. A number of years ago my grandpa had kidney failure and because of the nurses and doctors who saved him that day, he was given many more years of life. And cookies! Here’s the story: when I started baking a few years ago, I would bake extras for my grandparents when I knew I was seeing them that day. I’d bake little tea muffins or cupcakes without frosting, put them in a tupperware container, and carry them with me in the car like a prized possession. I eventually began baking cookies with a venegeance and little by little, muffins and cupcakes were squeezed out in favour of cookies. And my grandparents loved them. My grandpa loved them so much he ended up bringing one or two with him every time he went to the hospital for his dialysis appointments. For anyone who has a family member, loved one, or friend who visits the hospital on a regular basis, you know just how draining it can be. My cookies not only gave him the little sugar boost he needed after his appointments (which would make him feel a bit weak and tired afterward), but they also gave him a little part of me and my joy. So now, I bake more cookies so my grandpa has something happy and yummy to enjoy during those dreary hospital visits. 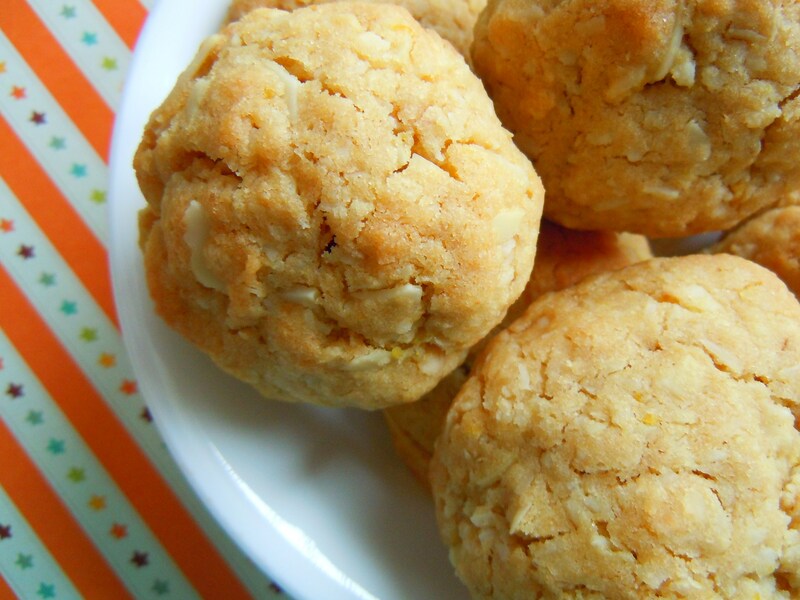 This past weekend, I saw my grandma and grandpa for Chinese New Year and I gave them a fresh batch of new cookies to enjoy because I knew it would make them happy. My grandpa pulled me aside and said to me, in Chinese, “when Debra is here, grandpa feels rich”. On top of the happiness I feel when I bake, this is all the validation I need to keep doing what I’m doing. Preheat the oven to 325°F. Line 2 baking sheets with parchment paper (*Deb’s Note: Depending on how big you make your cookie dough balls, you’ll need to reuse your cookie sheets a few times. My oven runs hot, so I actually don’t bother putting anything on the bottom rack and only use the top rack, placing 2 baking sheets vertically side by side). 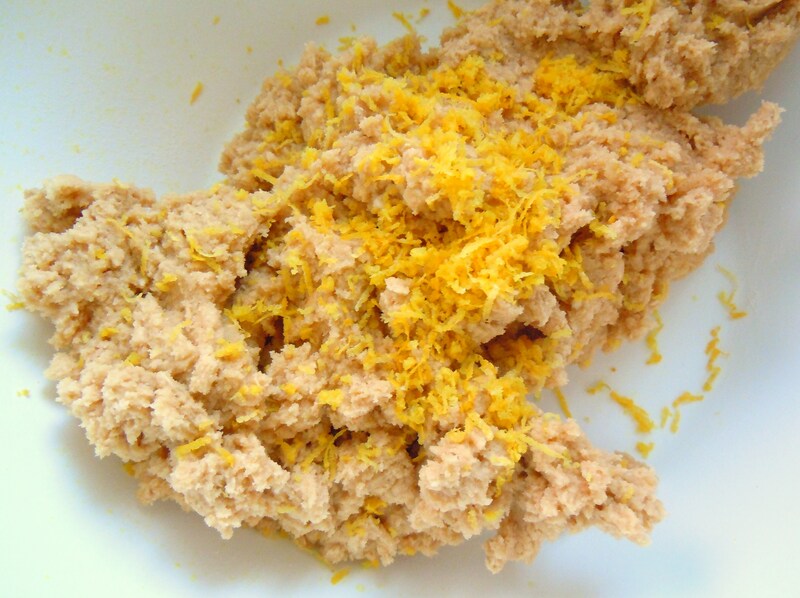 In a medium bowl, mix the flour with the oats, baking powder, baking soda, and salt (*Deb’s Note: I didn’t use the mixer for this step, I just used a large spoon to mix everything together). Beat the butter and both sugars at medium speed until creamy. Add the egg followed by the egg yolk, vanilla extract, lemon extract, and lemon juice, beating well between additions and scraping down the side of the bowl as necessary. 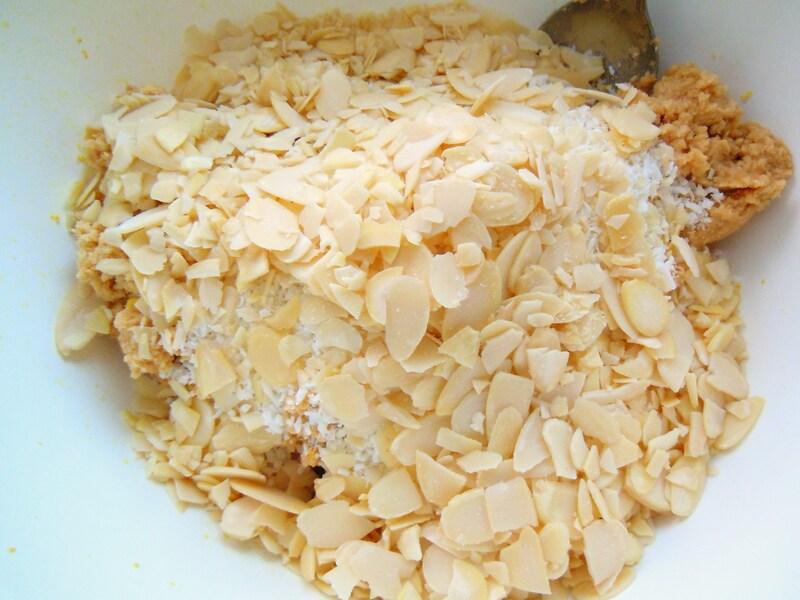 Beat in the dry ingredients, then add the lemon zest, shredded coconut, and sliced almonds, folding them into the cookie dough mixture (*Deb’s Note: alternatively, you can roll your cookie dough balls in the coconut if you want after the next step). 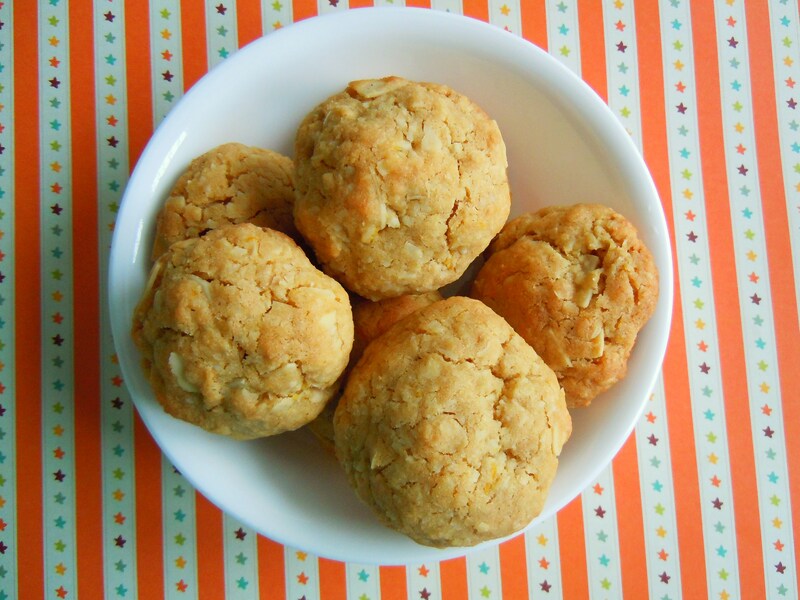 Using your hands, grab handfuls of cookie dough and shape into balls, about 1 inch in diameter. 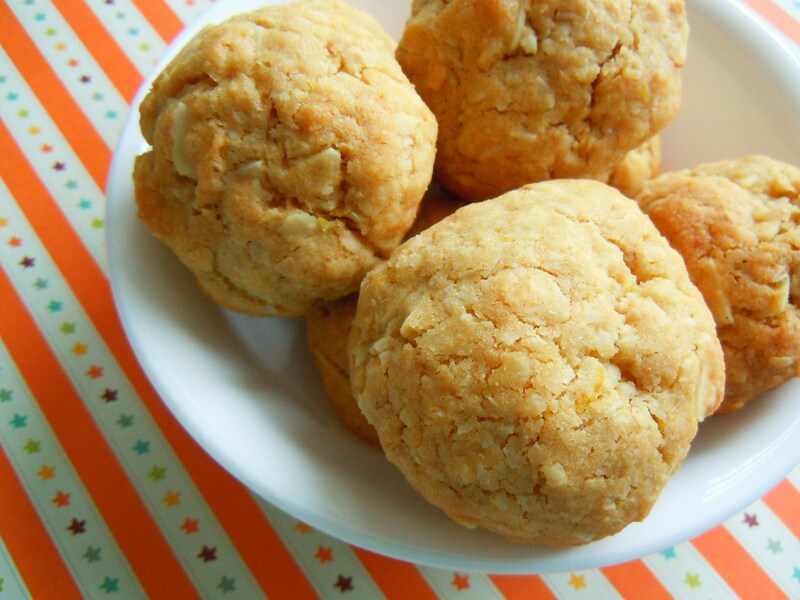 Place cookie dough balls onto the baking sheets, 2 inches apart. Bake 12-15 minutes, until the cookies begin to brown at the edges. Let the cookies cool on the baking sheets, then transfer them to a rack to cool completely (*Deb’s Note: I placed 15 on each baking sheet, but it all depends on how big your want you cookies. If you roll them into bigger balls, only place 12 on each sheet. Mine took about 14 minutes in the oven). Recipe inspired by Food & Wine magazine. Sampson, Sally. “How Baking Can Change the World.” Food & Wine November 2011: 130. 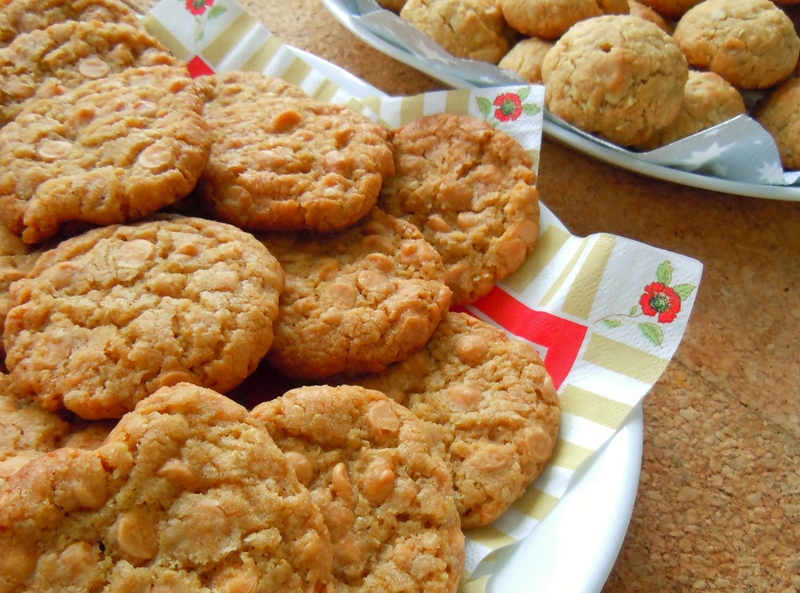 Remember the butterscotch chip cookies I baked during the holidays in December? The ones I photographed with cute snowmen in the background and the ones my mum went all cookie crazy over because she admitted she had a weakness for butterscotch? Okay, so imagine those cookies, but crunchier in texture, richer in flavour and aroma, with more beautiful crackling, and just as delicious if not more! It was cookie baking day in my house on Saturday and I was prepared to bake two kinds of cookies: another batch of butterscotch chip and a new lemon coconut almond cookie I was trying out. I was so excited to bake cookies (like there’s ever a time when I’m not!) I literally went out during a snowstorm to buy extra butterscotch chips because another store I had visited earlier in the week had run out. My mum thought I was crazy. I call it determined. And maybe a little stubborn. But if the cookies we baked were any indication, walking around town with snowflakes hitting me in the eye was worth it. I couldn’t believe how fabulous these cookies turned out! You must be thinking though, “why were you surprised? You baked these cookies before!” That is true. But there’s an important difference between these cookies and the ones I baked during Christmas: these ones have dark brown sugar in them, not light or golden. The darker the sugar, the more molasses it has in it and you can clearly see and taste the difference. I knew the amount of molasses in brown sugar would make a difference in baking, I just didn’t know how obvious the difference would be. 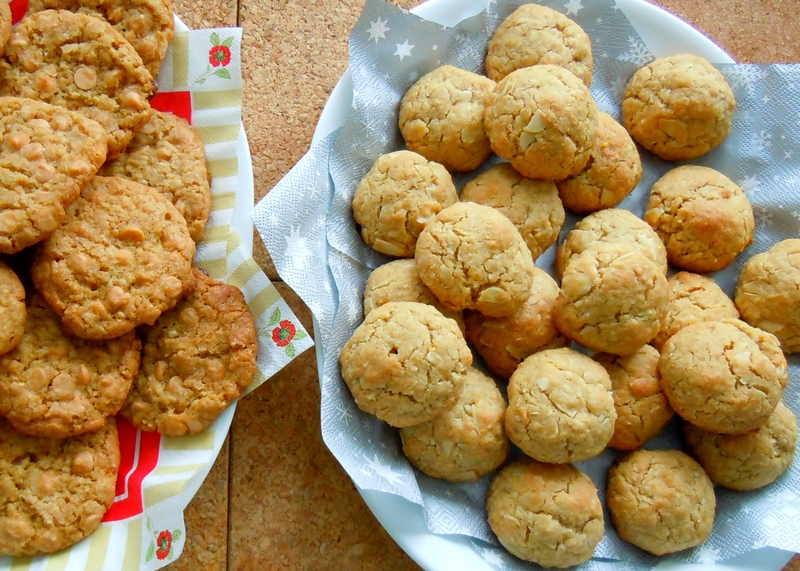 The ones I baked in December were chewier and lighter in colour while the ones I baked on Saturday turned out incredibly golden, like my cookies had been sunbathing on their parchment paper beach towels on the cookie sheet beach. Not only was there a difference in appearance (check out the crackling! 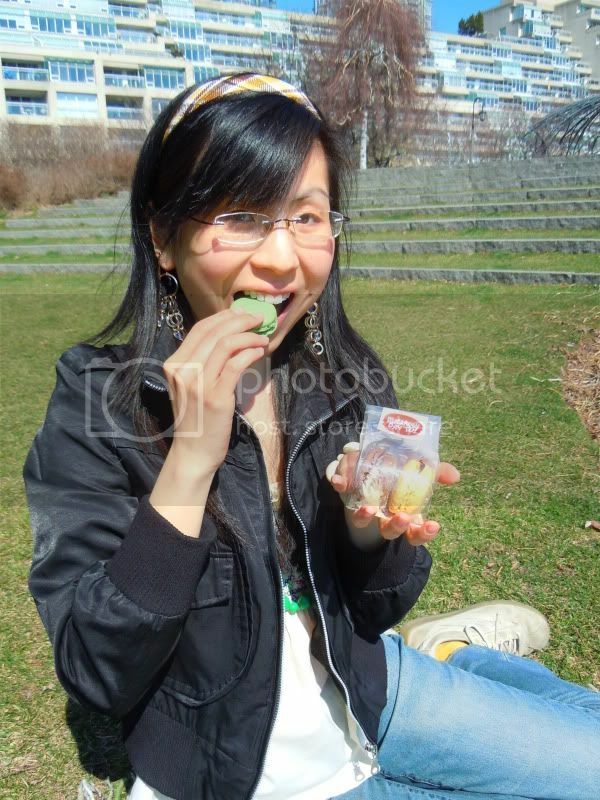 ), but there was also a change in texture and taste. 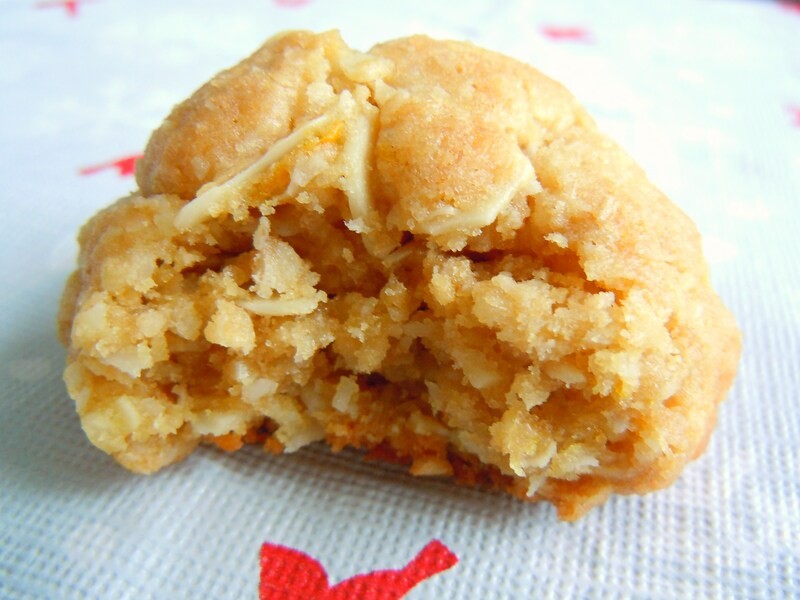 These cookies were crunchier and the flavour was so incredibly rich! It was like a cross between rich butterscotch fudge and brittle. 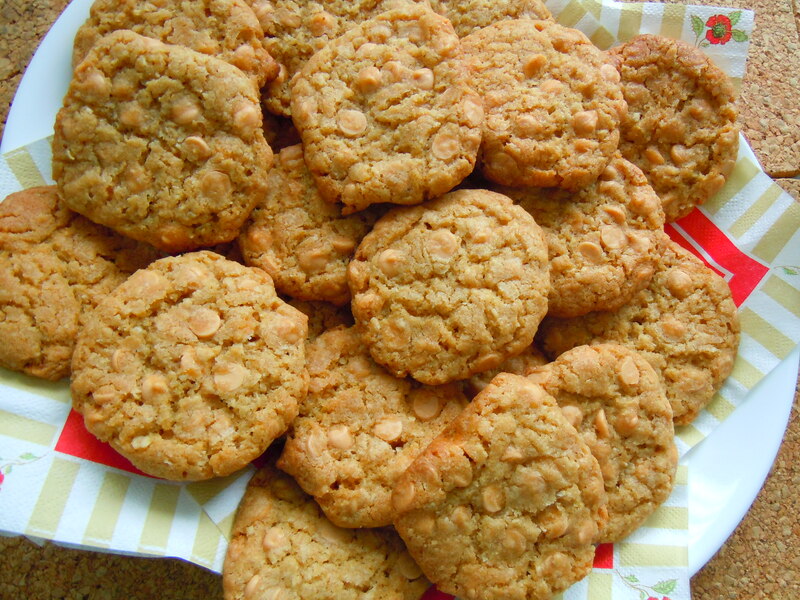 Hence, butterscotch brittles! 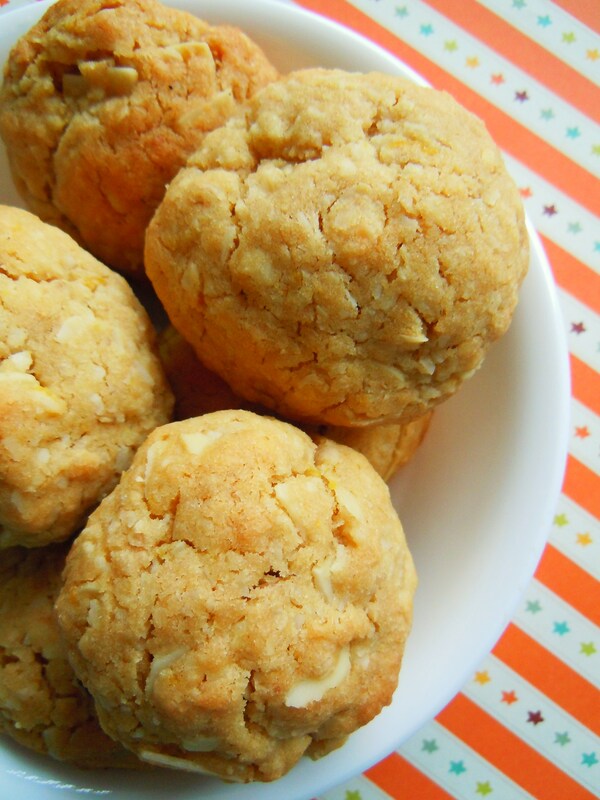 The recipe for the butterscotch chip cookies can be found here. 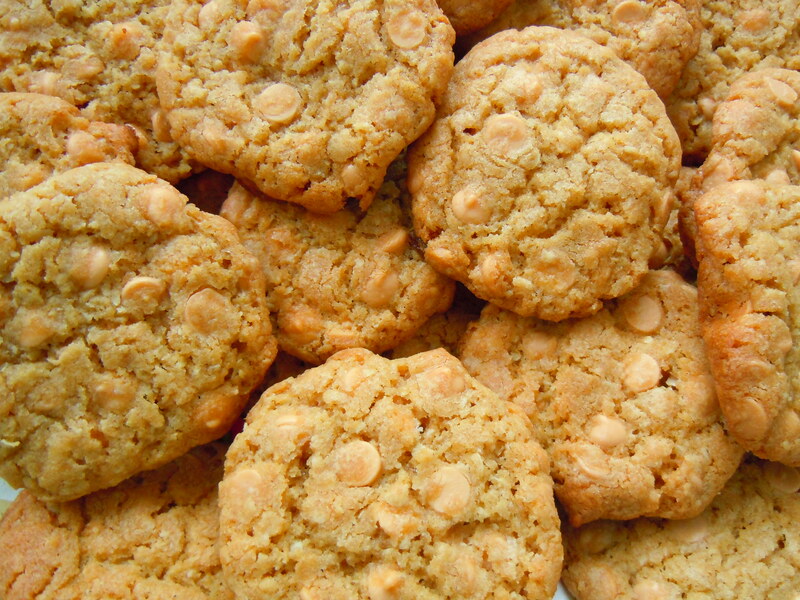 For chewier, lighter cookies, follow the recipe as is. For cookies like the ones I showed you all here, substitute the brown sugar with dark brown sugar. It’s been one crazy, topsy-turvy winter this season, but one thing is for certain: we can’t resist that silent, magical feeling we feel when we watch snowflakes gently fall from the sky and the breathtaking, picturesque scenes of pure white snow on pine trees and rooftops. We may not enjoy shovelling, and we may mumble and grumble about winter under our five layers of clothing, but we all know that feeling of serenity that comes along with the winter season. This is why I’ve enjoyed scrapbooking winter and holiday layouts so much over the past few months. I didn’t think I’d love it this much because in reality, I’m not much of a snow bunny, but when I put scissors to paper and stickers to cardstock, winter is one of the most beautiful and versatile themes to scrapbook. I love using winter themed stickers and embellishments (snowflakes! mittens! snowmen! hot chocolate!) and I love how I can simaltaneously play up the cool, icy colours of winter (whites, grays, and blues) and bright spring ones, such as greens and pinks, all at once. 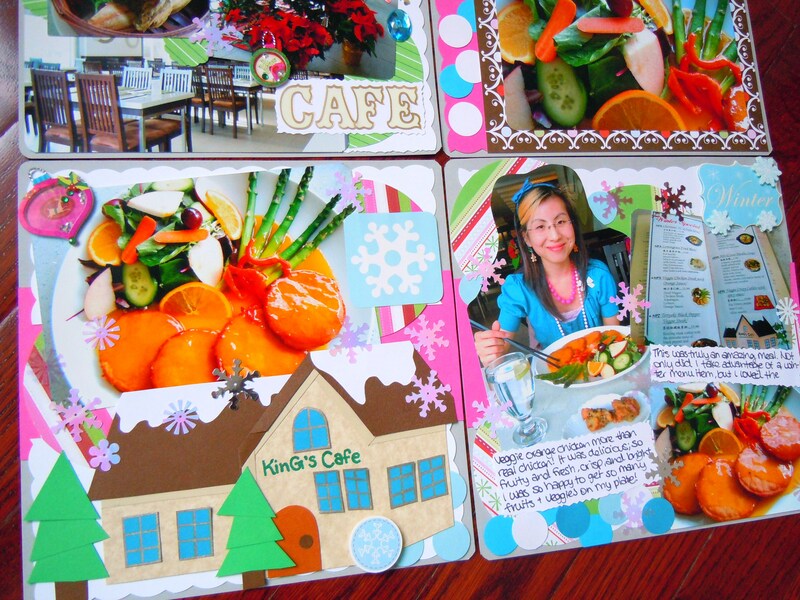 And scrapbooking winter comfort food is so much fun because you get to focus on all the things that make you feel warm and cozy. The hot chocolate one I made for The Hot Chocolate Series is one of my favourite layouts to date because I put so much creative energy into piecing together a colour scheme and building a winter story out of it. 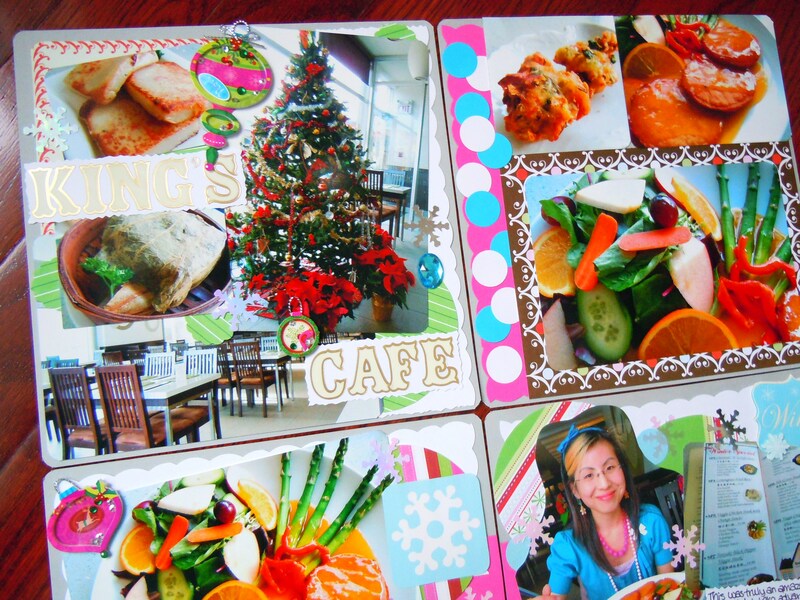 You’re probably wondering why some of the photos on the scrapbook layout look so familiar, especially the one of me (hint: the photo is from a page on my main toolbar), and that’s because those photos were featured in December 2010 (yes, 2010!) 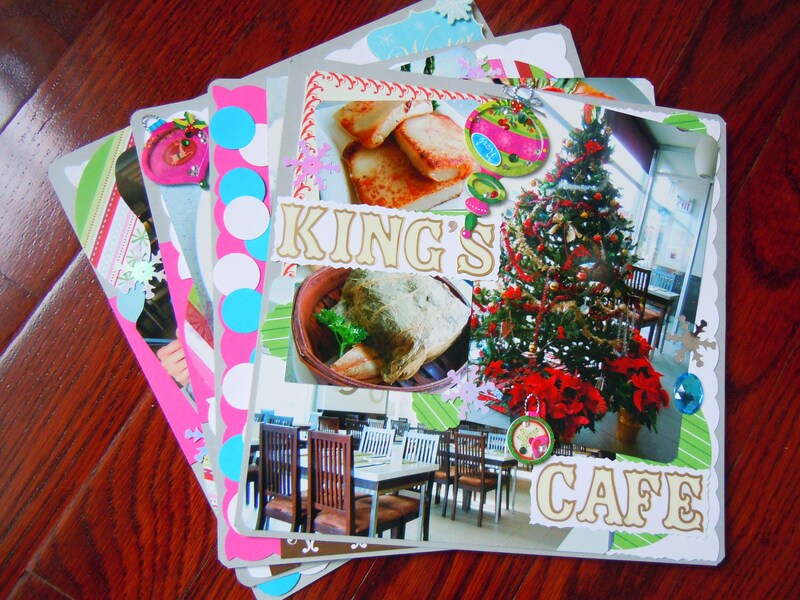 during my first month of blogging in my first King’s Cafe post. It’s taken a little over a year for me to get around to, but I finally made a scrapbook layout for it! Let it be known that there is no rhyme or reason to the order and sequence of scrapbook layouts that I create and post here. Sometimes I’ll create and post things a little more strategically, but really, it’s about the amount of time I have to devote to a particular layout, idea, or set of photos and this set has been waiting in the wings for months! This layout was so much fun to make. 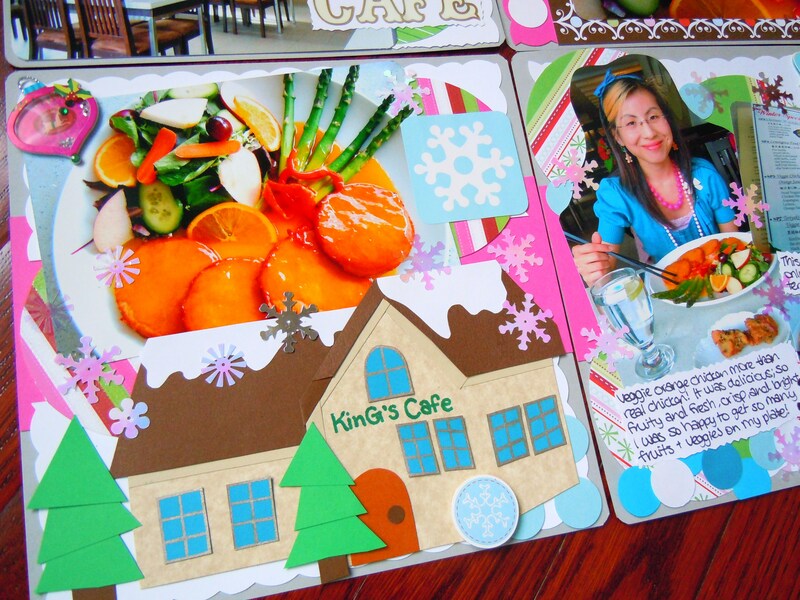 The layout was entirely devoted to and inspired by King’s Cafe’s seasonal winter menu. 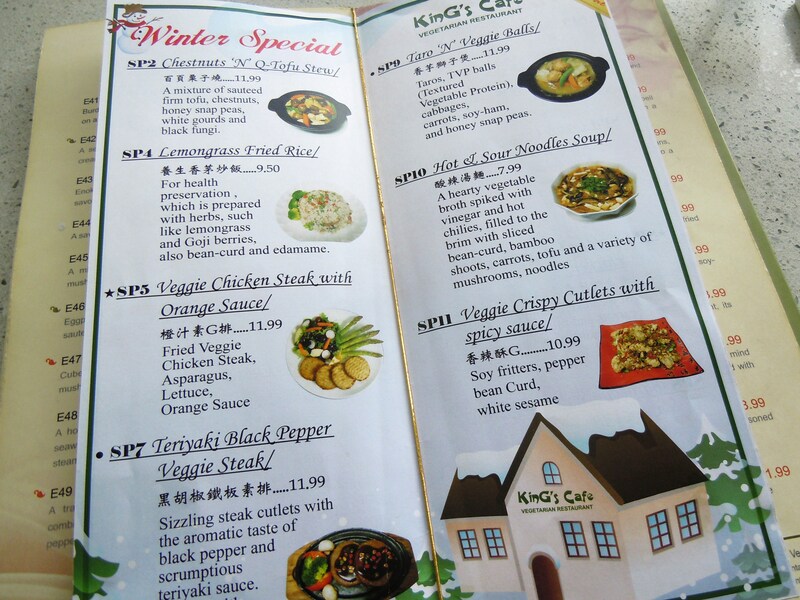 King’s Cafe has a winter menu that they put out every year for the season and there are special menu items featured in it that are not available during the rest of the year. For example, to my knowledge, the meal I had (the orange veggie chicken with asparagus, fruit, and green salad) is exclusive to the winter menu, along with the amazing lemongrass fried rice and many other dishes. 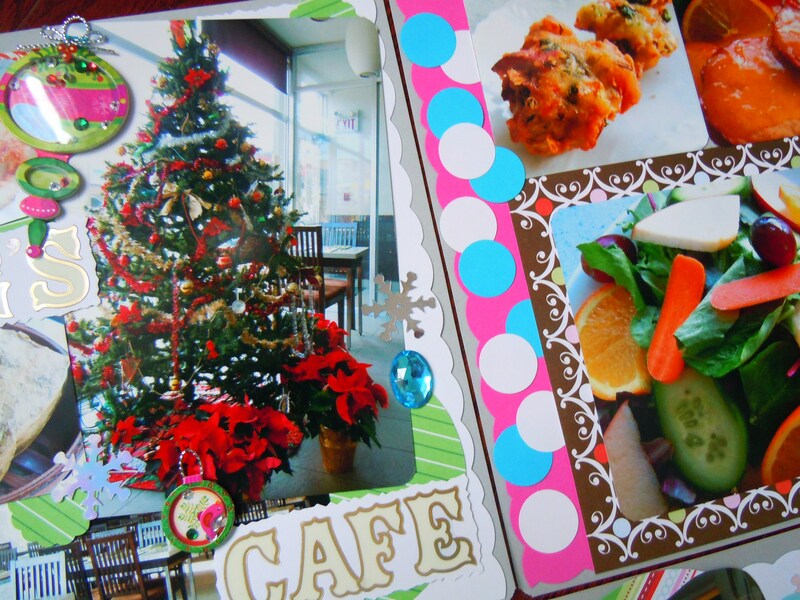 Scrapbooking these photos made me realize just how much more I wanted another meal at King’s Cafe – I’ve been craving their delicious food for months! Look at the adorable winter house! 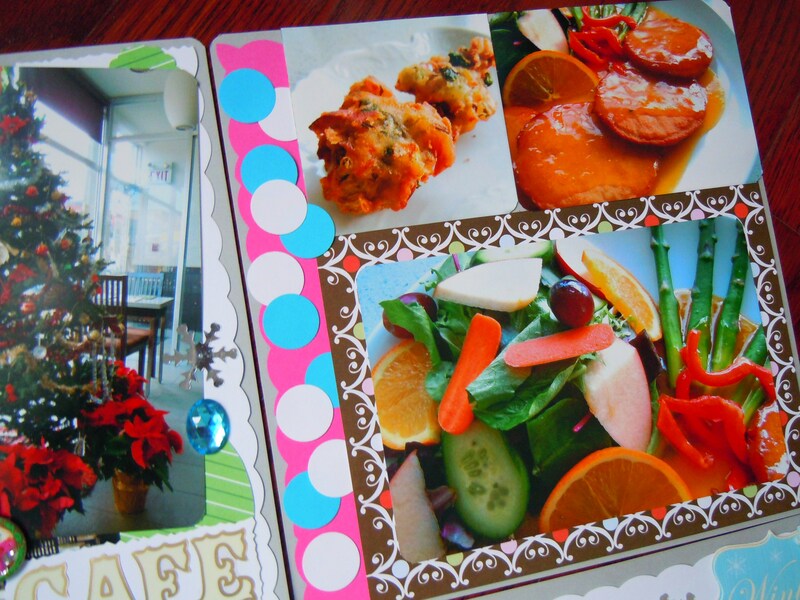 I wanted to use the bright colours from my meal and the colours I was wearing that day to guide the colour palette, and the adorable winter house pictured in the winter menu as a focal point. I knew right off the bat that I wanted to use gray as a base and bright colours to complement the melancholy, wintry shade. The main colour palette was a mix of gray, white, bubble gum pink, and bright sky blue with pops of green. I used the orange from the food photos and a bit of brown to warm everything up. I was so excited to make my own little King’s Cafe winter house out of paper and cardstock and I think it turned out pretty darn cute! The most fun I had was actually making the windows. The bright blue jumps off the page, I got to use my old-school brown metallic gel-pen, and windows are just fun. They were always my favourite Lego pieces to play with! 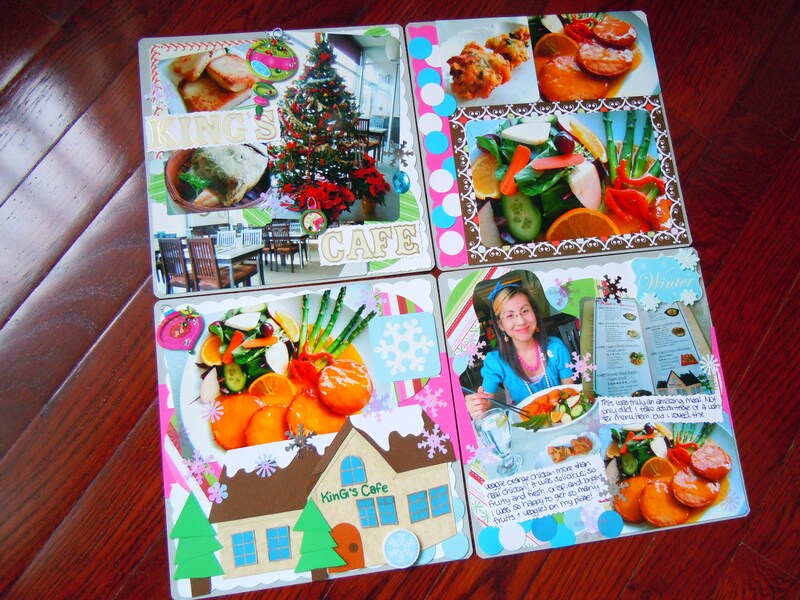 You all know how much I adore seasonal menus (especially fall and winter ones), so we’ll see if I can around to scrapbooking more winter meals (and maybe a Hot Chocolate layout, Part II!) before the weather gets really balmy and spring is here! Scrapbooking materials used: gray, white, bubble gum pink, emerald green, powder blue, beige, chocolate brown, and cappuccino cardstock (Recollections); bright sky blue construction paper; Green Pinstripe patterned paper (Recollections Basics); holiday patterned paper (Me & My Big Ideas holiday paper mat pad); holiday striped cardstock (DCWV holiday cardstock mat pad); cream and gold foil “circus” alphabet stickers (Recollections); Christmas ornament adhesive embellishments (Recollections); “Winter” adhestive embellishment (K&Company); holographic snowflakes; scalloped edge decorative scissors (Provo Craft); deckle edge decorative scissors; circle paper punch (Marvy Uchida). 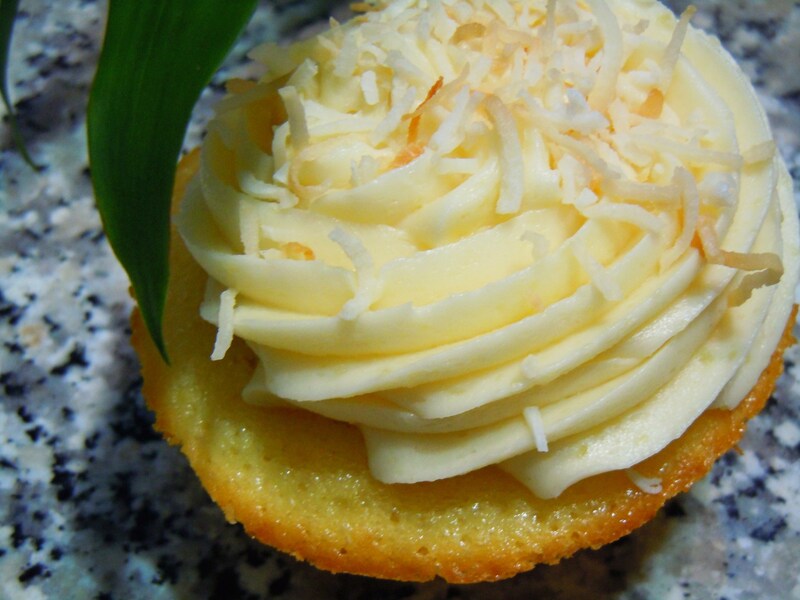 If You Like Pina Coladas, and Getting Caught In the Rain… – The Creamy Pineapple Cupcake at Prairie Girl Bakery! “If You Like Pina Coladas” is one of my favourite songs to sing along to on the radio and I’ve been waiting for the perfect opportunity to use a song lyric from this song for ages! If there’s any opportunity for me to use a song lyric or two in a post title, I’ll take it! Getting the special pina colada cupcake from Prairie Girl Bakery this month was exciting in and of itself, but to have a pina colada cupcake sunbathing under a tiki umbrella while actually carrying my little square cupcake box in the rain? It was truly meant to be! In all seriousness though, my love for cupcakes is worthy of a chuckle and an amused eye roll and I am grateful to everyone (especially my sweet boyfriend) who humours my obsession. When I have a hankering for a cupcake, which is truthfully almost every day, I will get one rain or shine. On this particular day, I looked like an absolute mess with my hair tucked into my hoodie as I trotted across the downtown streets of TO in the misty rain with Prairie Girl cupcake box in hand. And I have to say, the creamy, fruity, toasty cupcake was well worth the temporary disheveled appearance. 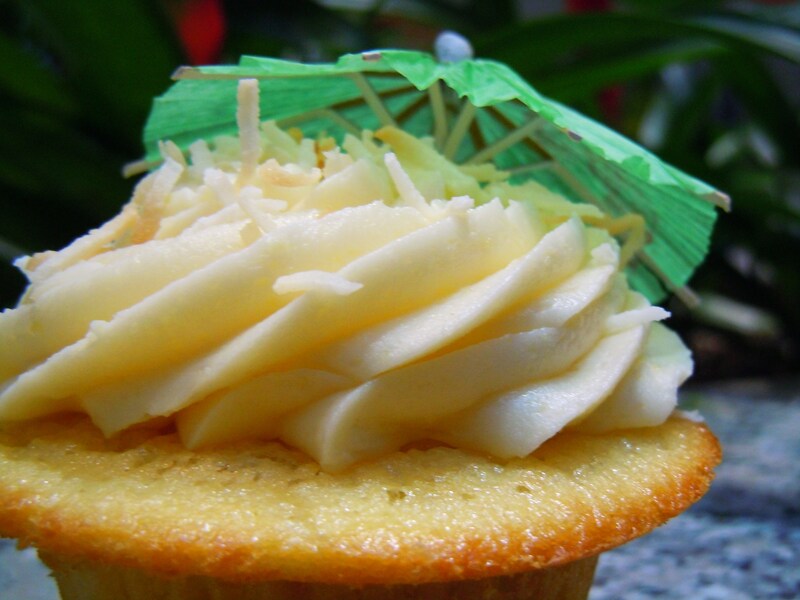 The Pina Colada Treat of the Week featured a golden buttermilk cupcake topped with big generous swirls of creamy pineapple frosting, toasted shredded coconut, and an adorable tiki umbrella in your choice of colour! The cupcakes were so cute with the little umbrellas sticking out of them and because I was able to choose which colour umbrella I wanted, I chose a bright green one because it reminded me of breezy palm trees. 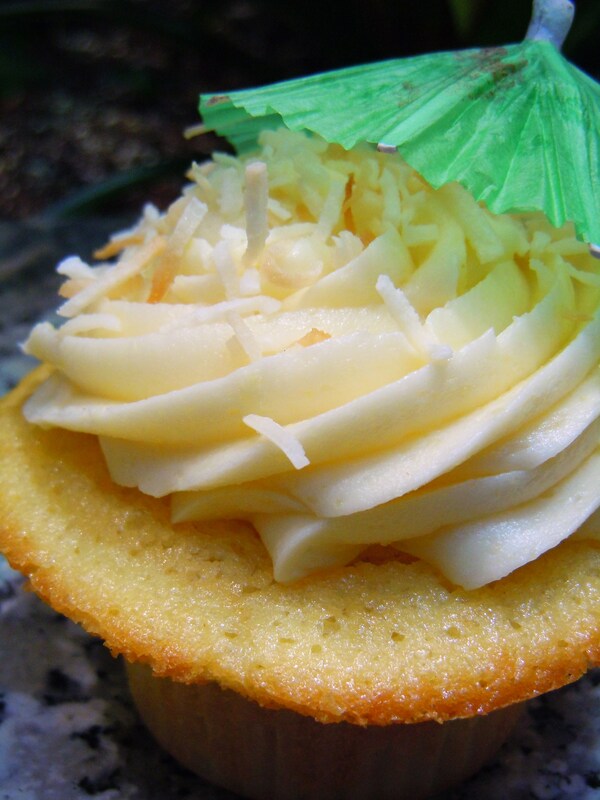 The pineapple frosting had a great mix of fruitiness and tartness to it and the toasted coconut added an incredible amount of crunchy, toasty texture to the creamy richness of the frosting. The best part though? 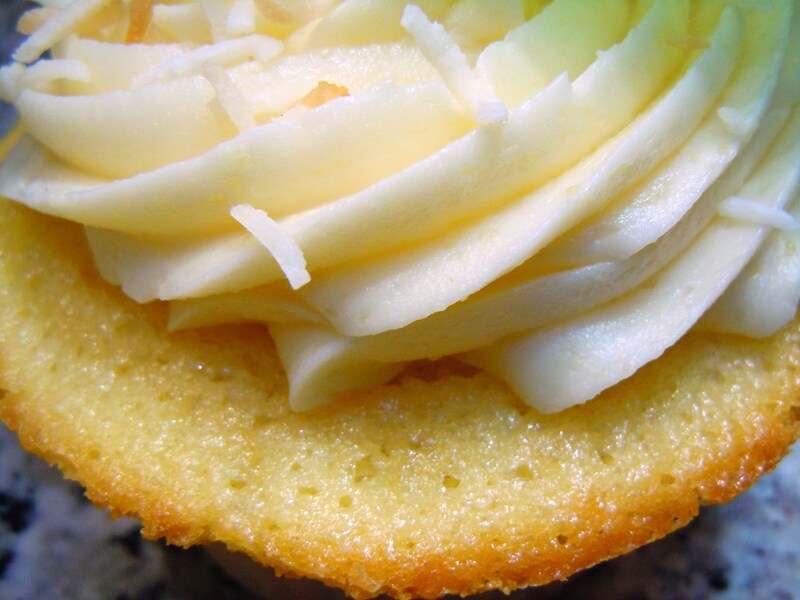 The golden vanilla buttermilk cupcake was so soft and moist on the inside and literally golden yellow brown and toasty around the edges of the cupcake hood on the outside. 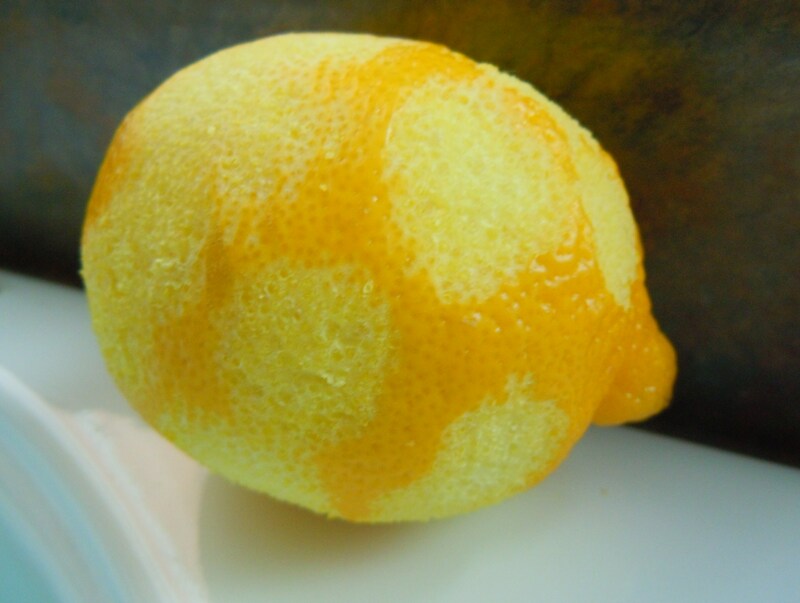 That outer edge was so delicious and the crispness of it added so much more depth in flavour. You had the light airiness from the moist interior and the warm, bold vanilla flavour on the outside. Photographing cupcakes around the city can sometimes be a challenge when tables and chairs aren’t available inside the shop, but sometimes hunting down the perfect spot to snap photos can also be fun. It trains you to think on your feet, to improvise, and to utilize your surrounding environment. 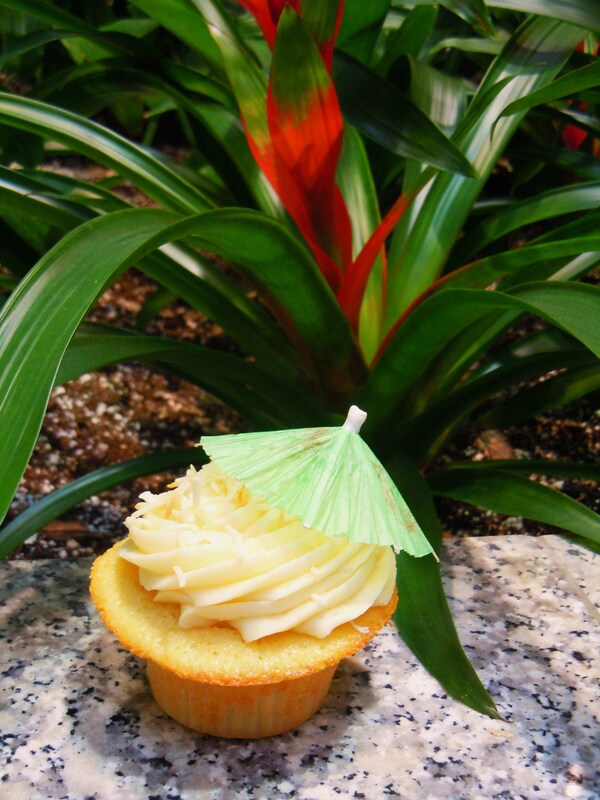 What better spot to the photograph a tropical themed pina colada cupcake than around tropical plants? Just to be a tease, I’ll let you all figure out the exact spot I took these photos inside First Canadian Place! I set my cupcake down near some tropical bromeliad flowers and plants and made a little tropical cabana backdrop for it. It was fun and I think they turned out cute! Since my last Prairie Girl cupcake post in September, there’s been some exciting news and changes! 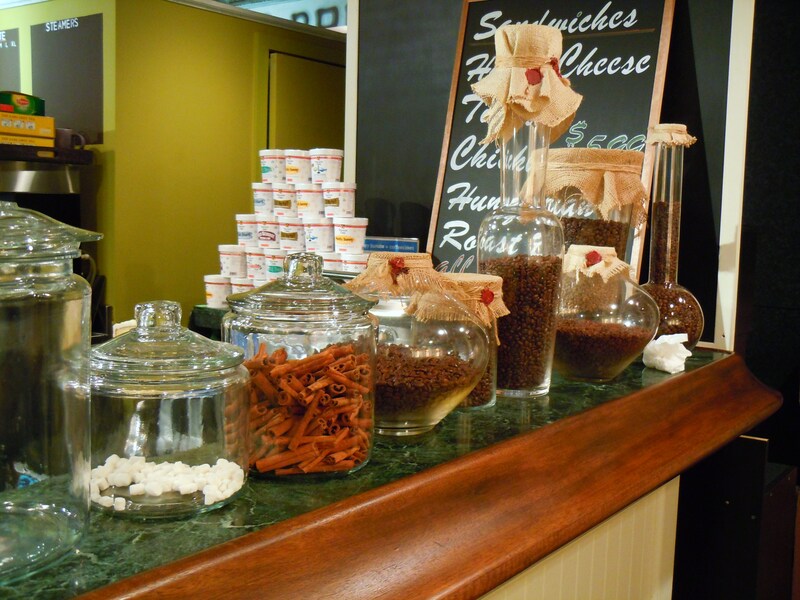 For starters, Prairie Girl opened up their 2nd location in First Canadian Place back in November! Their underground PATH location is smack dab in the middle of the hustle and bustle of FCP’s Marketplace food haven and you should see the crowds and line-ups! Prairie Girl is one of my favourite cupcakeries in the city and I’m so happy that they’ve been so successful that they opened a second location. In addition to the new location, Prairie Girl has also added even more fun and flavour to their menu! 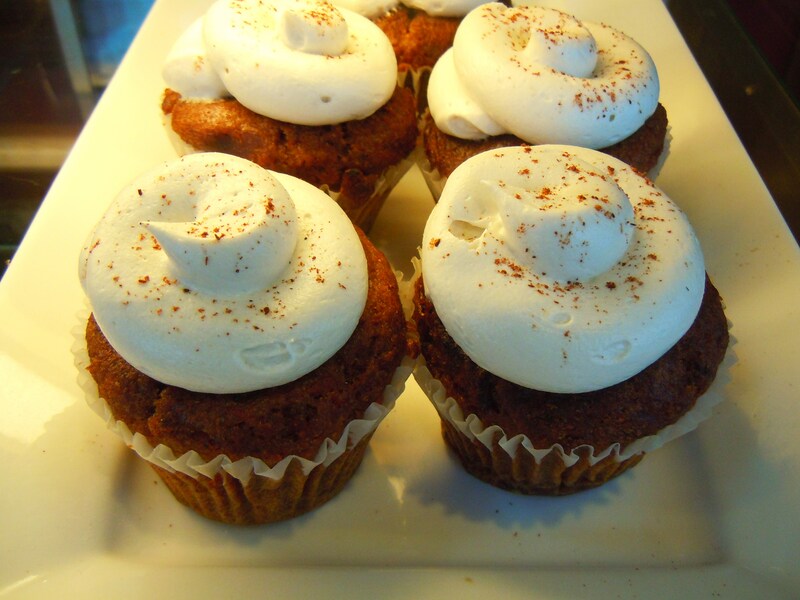 Aside from their permanent daily flavours of cupcakes and frostings, Prairie Girl would always feature a special Treat of the Week, available for 7 days in both mini and regular sizes. Every week there would be a new and different cupcake flavour and depending on the response, Prairie Girl would sometimes bring back popular favourites for the Treat of the Week over time. Instead of having only one Treat of the Week, there are now TWO Treats of the Week – a special flavour on the Golden Buttermilk vanilla and a special one on Grandma’s Dark Cocoa. I absolutely love this new arrangement! I love keeping up with all the creative flavours and themes on a weekly basis and the pina colada cupcake was one that I couldn’t pass up. Pineapple and coconut? Amazing. Tiki umbrella? Even more fabulous. 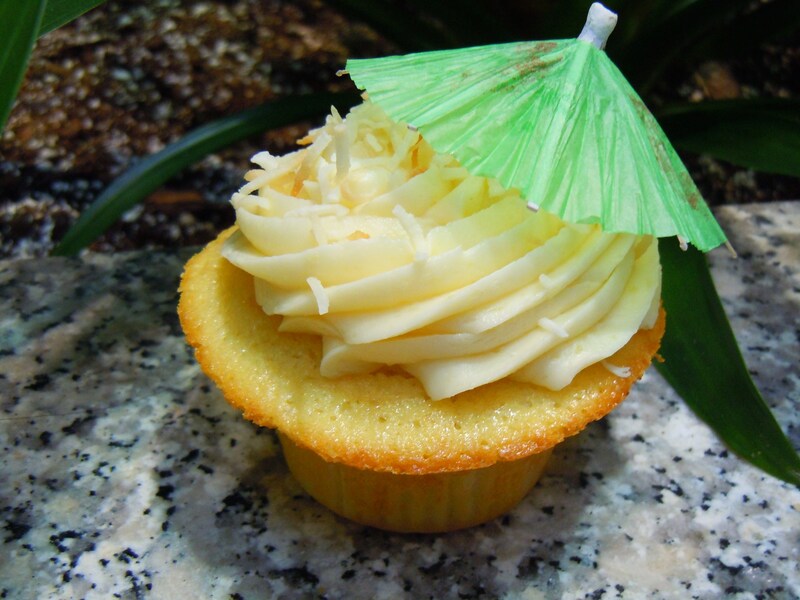 A delicious pineapple coconut cupcake with tiki umbrella in the rain while humming Jimmy Buffett’s lyrics? Priceless. Have you ever had a meal so wonderful and delicious you daydreamed about it into the next day? Because I sure have and now that I’m writing about it I’m getting lost in my food daydream all over again! I had one of the most amazing vegan meals this past week. The meal was full of lush green vegetables, pops of colour, and crunchie munchies, and the meal was devoured in Kensington Market’s beloved vegan haunt, Urban Herbivore. Urban Herbivore has been on my “to-go” list for ages and I’m ecstatic that I finally crossed it off! I’ve known about their vegan sandwiches for a long time and I always knew I would get around to trying them out eventually, but I never anticipated falling head over heels in love with their salad bowls. That’s right, I’m a girl in love with a bowl of leafy greens, legumes, and crunchy munchies and I’m already looking forward to my next date at Urban Herbivore. What can I say? I get around. 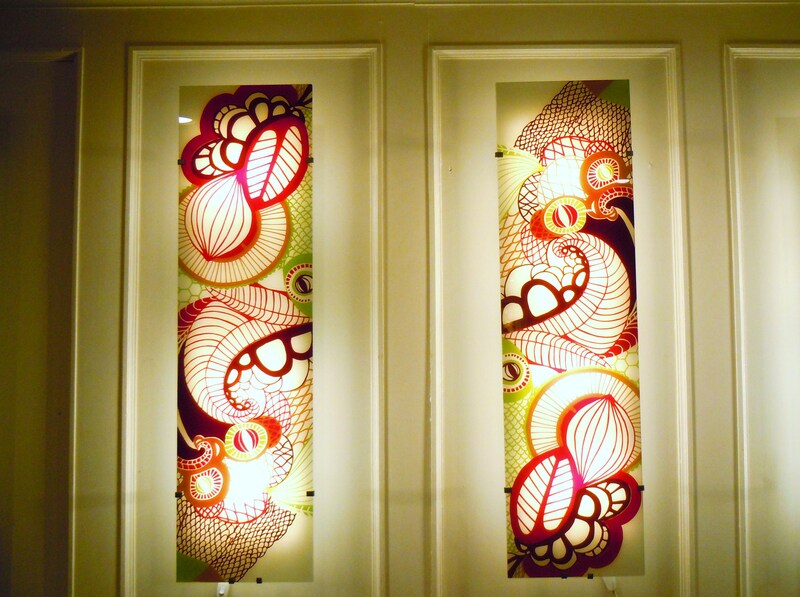 Urban Herbivore is the sister restaurant to vegan dinner and tapas bar, Fressen, on Queen St. West. Open for business at 9am, Urban Herbivore is the morning, lunch, and afternoon counterpart to Fressen, serving vegan sandwiches, salad bowls, grain bowls, Moroccan stews, coconut curries, fresh smoothies, veggie juices, and vegan baked goods and sweets! When I finally hunkered down and made the decision to go to Urban Herbivore, I went in with the intention of inhaling one of their vegan sandwiches and featuring it the Vegetarian Sandwich Series. 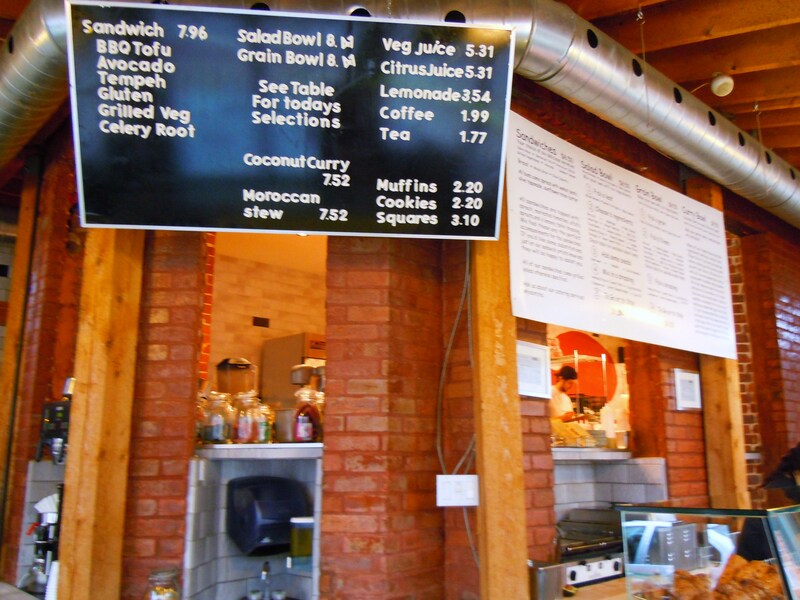 I looked up at the menu board, mentally tossed around the option of having either the BBQ tofu or the avocado sandwich, and then looked over at the 2nd menu board with the sandwich, salad bowl, grain bowl, and curry bowl descriptions. And that’s when everything changed. 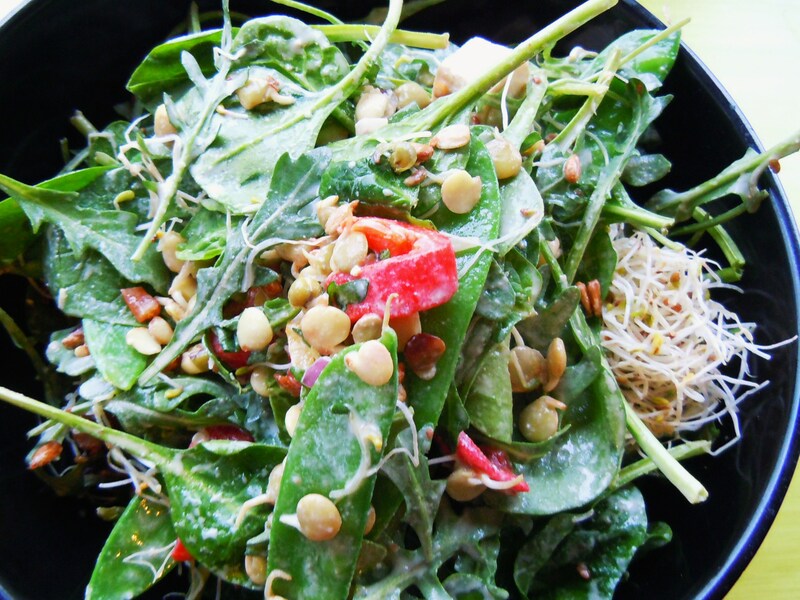 At Urban Herbivore, you can be the creative master behind your vegan meal! You can mix and combine vegetables, proteins, beans, legumes, and grains to your heart’s content and in the end, you have your very own custom designed salad or grain bowl specially put together by you! Urban Herbivore isn’t set up the same way as Kale Eatery though. It’s not a self-serve buffet. Much like Freshii, you choose your ingredients and someone mixes it all together for you. However, instead of making your choices on menu papers like you would at Freshii, you simply tell whoever is serving you what you want and they put it together in front of you as make your choices. I was captivated by the possibility of putting together my own special salad bowl combinaiton, so I dropped the vegan sandwich plan like a hot potato. I admit, part of me felt a little guilty for ditching my initial sandwich date for greener pastures, but I made the sandwich date a future rain cheque promise that I was fully intent on keeping so the bad feelings didn’t last for long. Salad bowls, which are priced at $8.50, start with a leaf base. 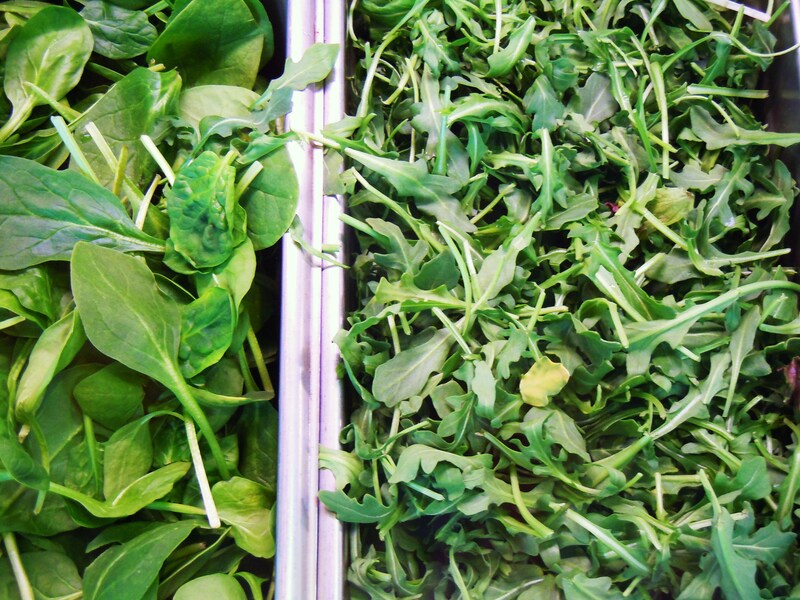 There are 3 green leafy salads to choose from: mustard greens, baby spinach, and spinach and arugula. 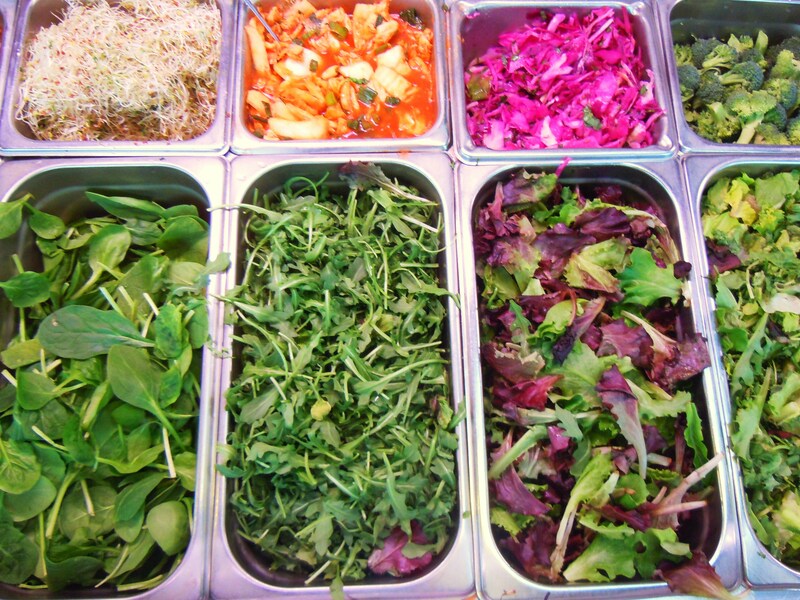 After choosing your leafy green mix, you add your choice of 6 different ingredients from the vast array of yummy choices on hand. 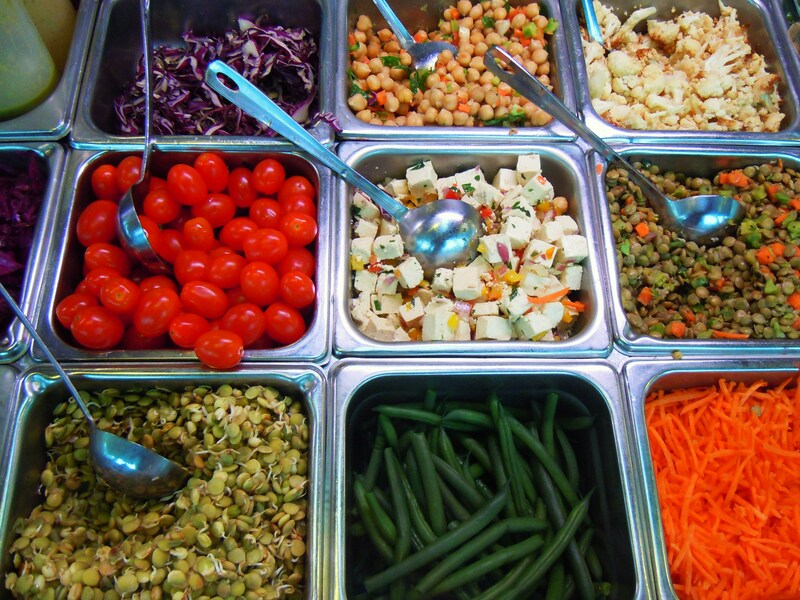 The selection of vegetables and protein is fantastic! 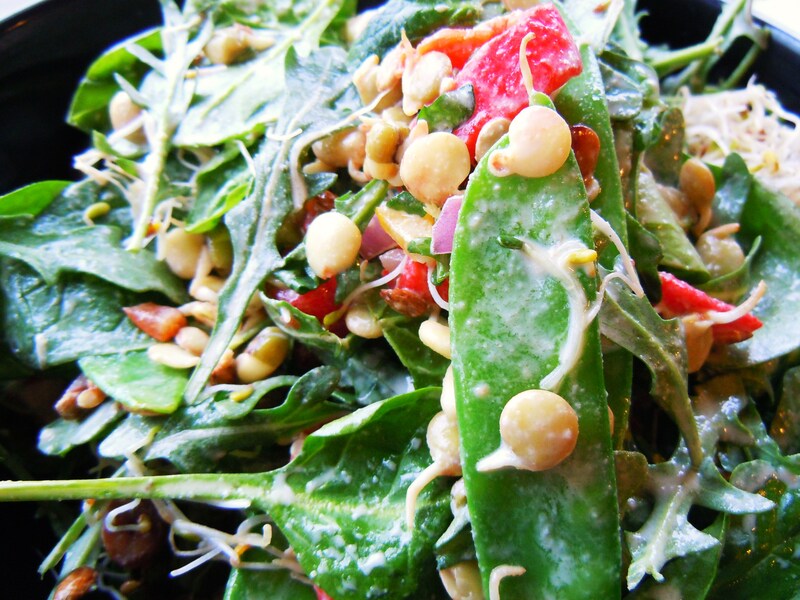 Think green beans, mushrooms, sprouts, roasted peppers, shredded carrots, chick peas, red cabbage, cauliflower, cherry tomatoes, beans, tofu cubes, lentils, broccoli, kimchi, pickled vegetables, and so much more. 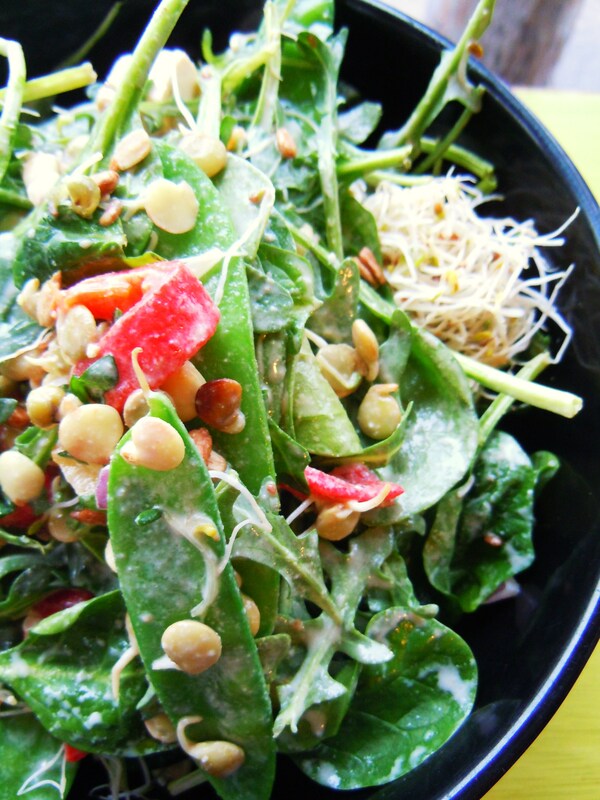 Then, you finish off your special salad bowl with some texture and crunch in the form of sunflower seeds, pumpkin seeds, or sliced almonds, and finally, your choice of dressing. Okay, so let’s break my salad bowl down. 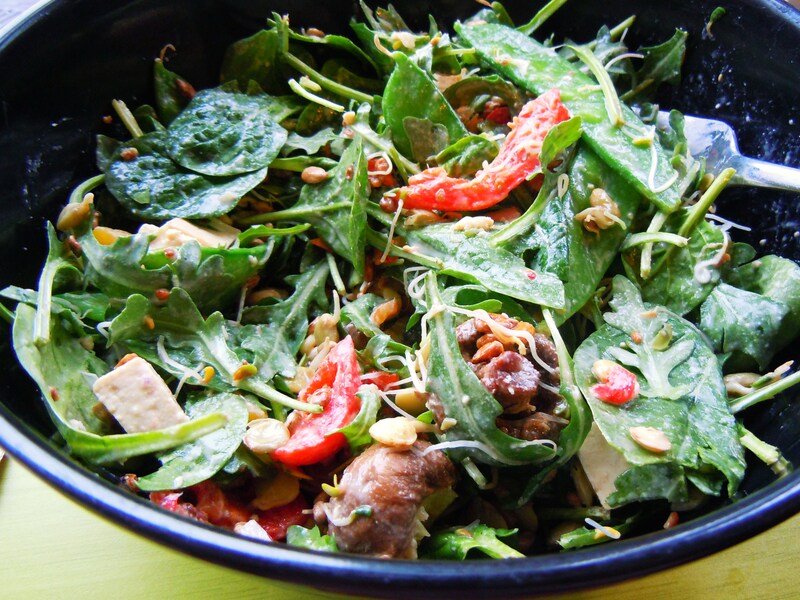 I chose a baby spinach and arugula green leaf mix because they’re my favourite leafy greens and to that I added snow peas, whole mini button mushrooms, roasted red peppers, alfalfa sprouts, lentils, and some delicious cubes of tofu. I went wild for the sunflower seeds and topped it all off with some lemon tahini dresssing. This salad was, by far, one of the best vegan meals I’ve ever had in my life. I know a salad seems very simplistic and dare I say, a little boring to some people, but I’m telling you, this salad bowl was so incredibly delicious I devoured it all and still wanted more. The salad bowls are big and lush and so full of energy and life. I don’t think you could ask for a better meal. The textures and flavours were fantastic. 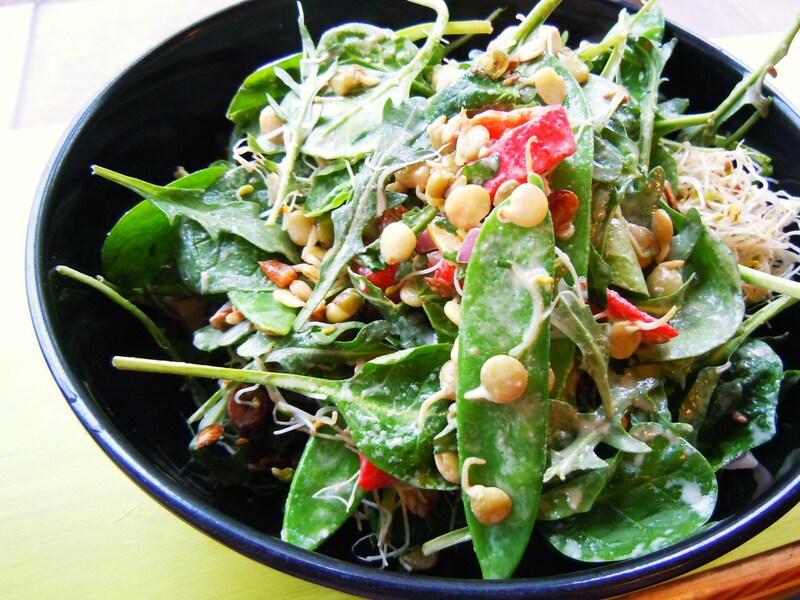 The sunflower seeds, lentils, alfalfa, and baby spinach leaves amped up the crunch factor ten-fold and the lemon tahini dressing was creamy and refreshing and flavourful. Ever since I had tahini sauce with falafel several years ago, tahini has been one of my favourites and it totally gave the whole salad that extra bit of richness and creaminess. Even though I’m not vegetarian or vegan, I love the versatility of it all. There are so many ways to integrate fruits, grains, legumes, proteins, and vegetables into delicious and filling meals and I’ve been lucky enough to mix and match and try out new foods and combinations in the company of vegetarian and vegan friends who live by these foods and only these foods. Going to places like Freshii and Fresh have been so much fun simply because of the creative freedom I’ve had over my food and Urban Herbivore is exactly the type of vegan eatery that feeds my love of food and creativity all in one. 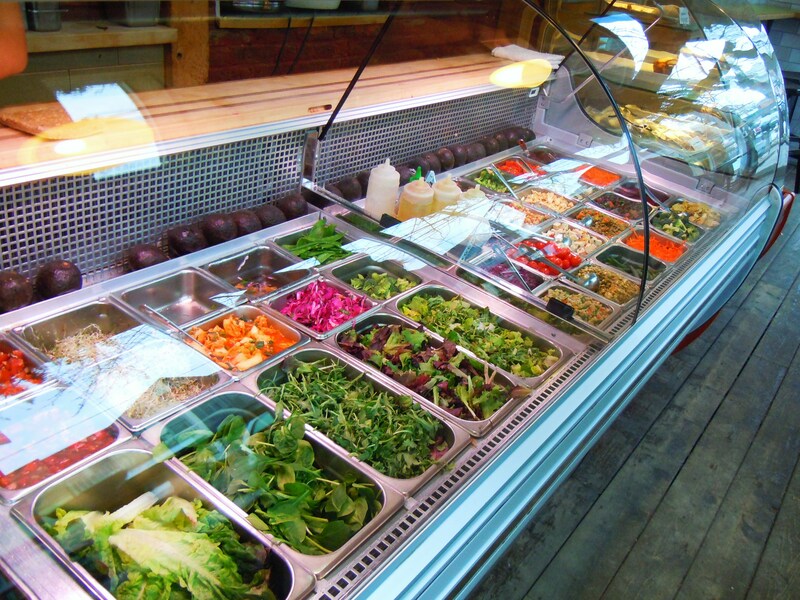 Urban Herbivore is located at 64 Oxford Street in Kensington Market, with a second location in Eaton Centre’s Urban Eatery. 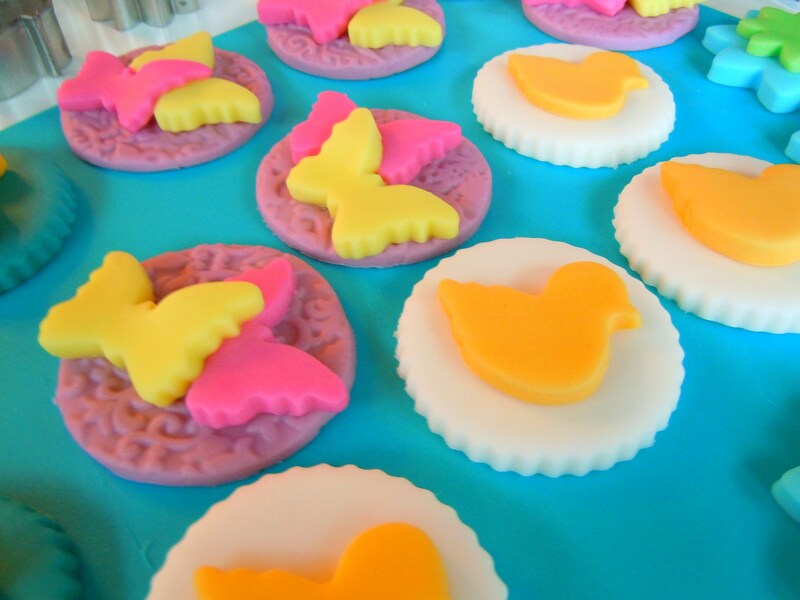 New Year, New Cupcake Projects at Le Dolci – Fun With Colourful Fondant Cupcake Toppers! 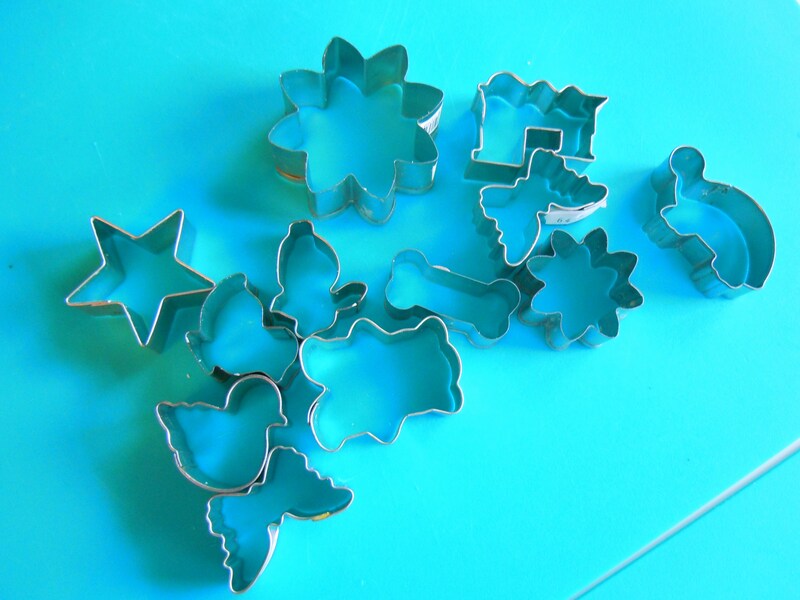 A new year means new cupcake projects at Icing Sugar Tower, Le Dolci studio! The last time I shared my sugary adventures was back in November and December when I was cake popping my way to Christmas with sprinkles and melted chocolate during the holidays. It was such a fun class to be a part of and it definitely ranked as one of my favourite Le Dolci memories and experiences. After a bit of Christmas time off, the Le Dolci crew started 2012 with a bang with cupcake orders, private parties, and corporate cupcake catering. Add to that a whole slew of macaron, cupcake, and cake decorating classes scheduled well into March and you have yourself one very busy studio! 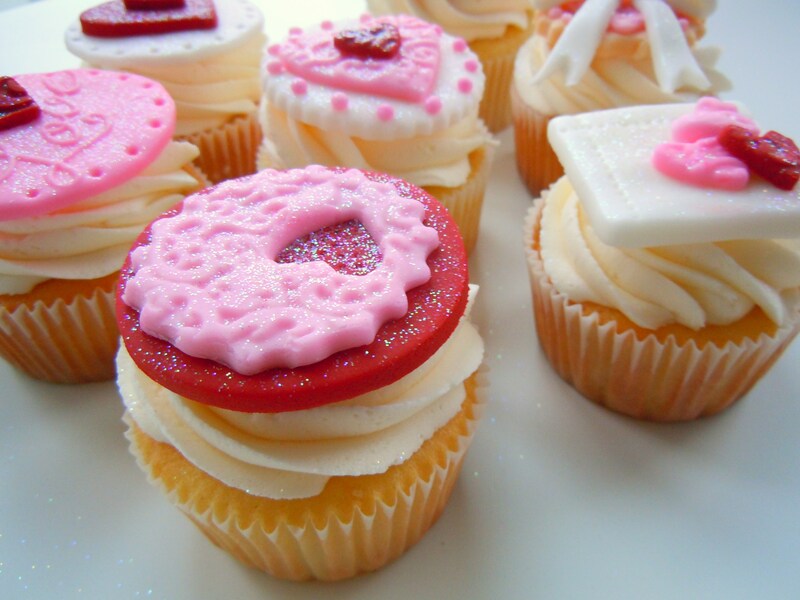 Upcoming classes include new kid on the block, Mini Fondant Cake Decorating; all-time favourites Marvelous Macarons and Designer Cupcakes; and sweet and seasonal Valentine’s cupcakes and cake pops. With a growing team, a sparkly new online store, and more and more cupcake baking going on in the Dolci oven every week, the new year is looking bright! 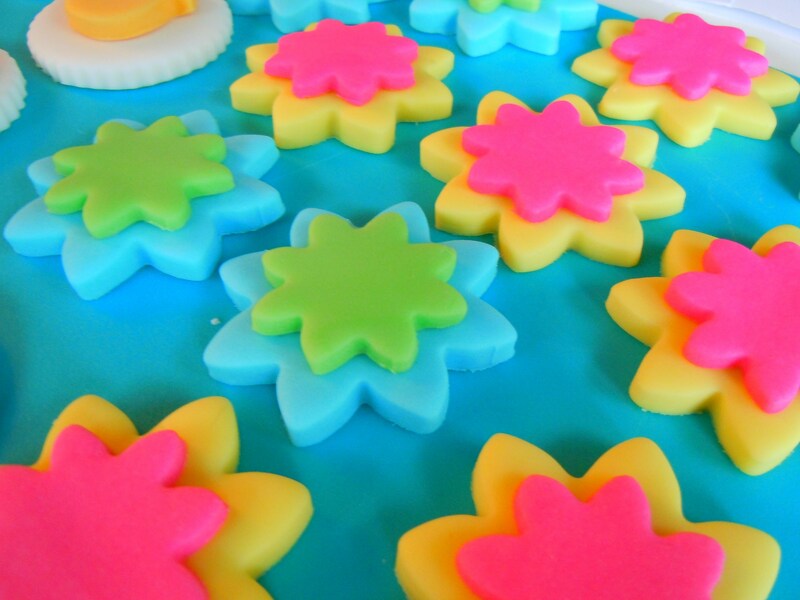 And bright was certainly the name of the game when I made these happy-go-lucky fondant cupcake toppers! 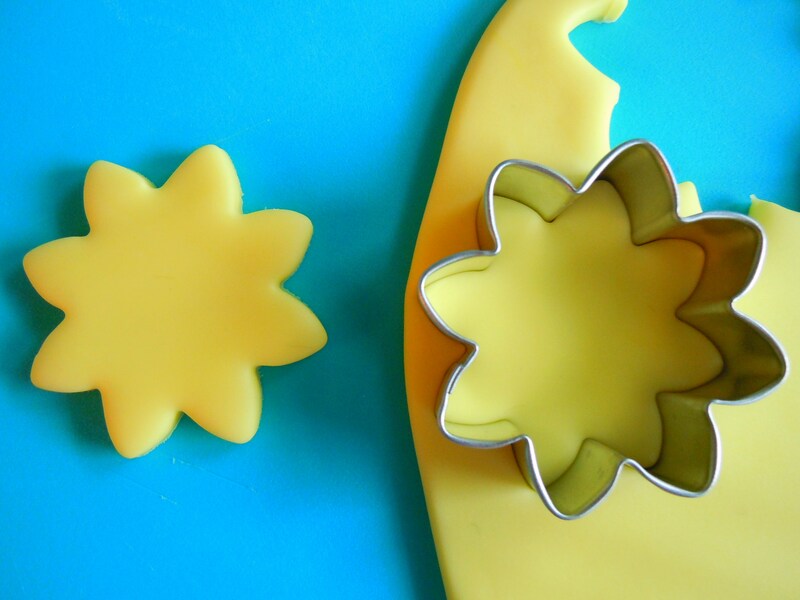 Not only do we jazz up cupcakes with pretty, colourful swirled frosting but we also design beautiful fondant cupcake toppers! 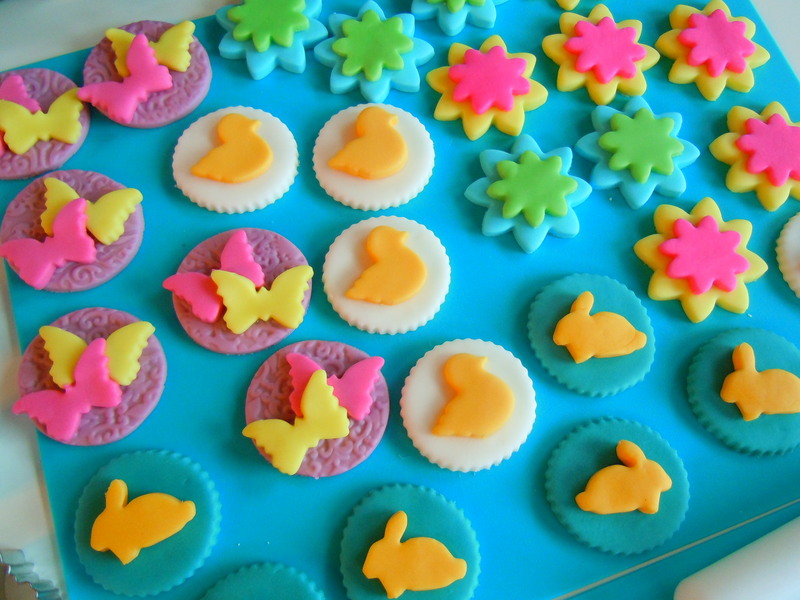 Cute, sophisticated, bright, subdued, romantic, feminine – whatever the mood or look, fondant cupcake toppers set the cupcake decorating bar high with an endless array of colours, styles, shapes, tools, and techniques to work with. Icing sugar queens, Lisa and Miya, along with Cat (queen bee of Sugar Baking.com) have created fondant cupcake toppers for past Le Dolci classes including Vintage, Designer, and Christmas and this time around, I designed the ones for a special 4-dozen order. The theme? Children and kid-friendly! Well, colour me excited! 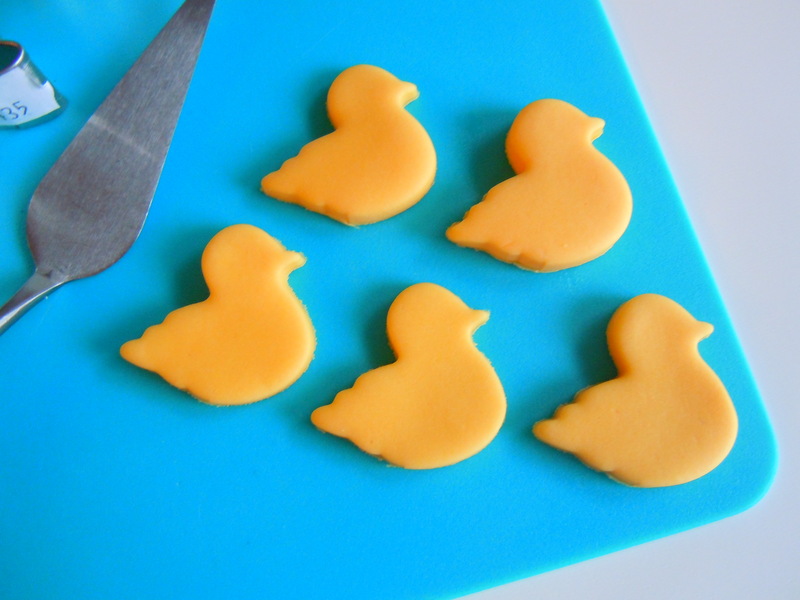 I set up my mini work station, grabbed a placemat along with tools, jars of fondant icing colouring, tooth picks, and fondant, and a smattering of children’s themed and kid-friendly cutters: duckies, turtles, trains, rabbits, stars, flowers, and butterflies among others. 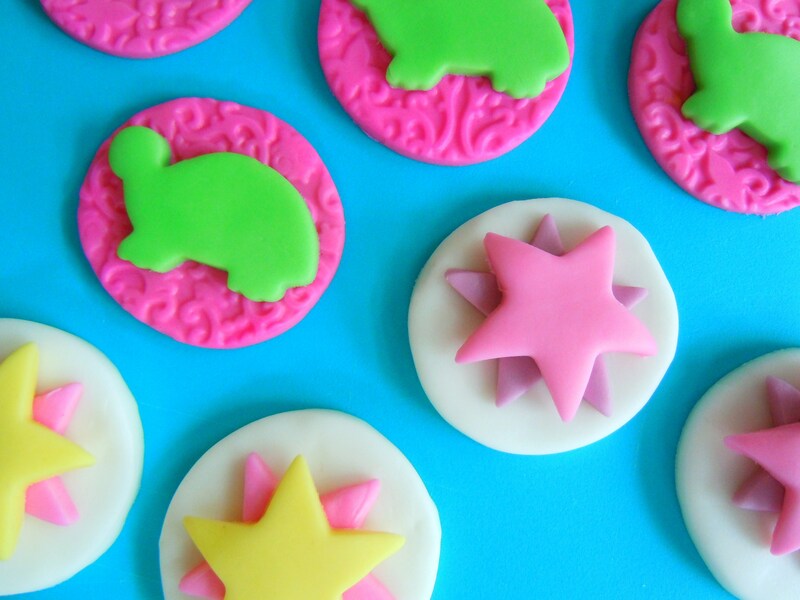 I’ll give a more in-depth and thorough tutorial later on in the future, but non-3D fondant toppers are basically created by rolling out fondant icing to the desired thickness, plunging different shaped cutters into the rolled fondant, and letting the fondant air-dry and harden on its own. Toppers like the ones I made start with a base (maybe a circle, a scalloped circle, a square, or a flower if you so wish) and the rest is completely up to you depending on theme you’re working with or the assortment of cutters you have or want to use. 3D toppers aren’t out of the question though! Even if you don’t have the time (or, let’s face it, the patience) to construct a dozen 3D trains, you can inject a little 3Dness into the mix by layering and making simpler 3D shapes like bows. I wasn’t going for a 3D look with these. 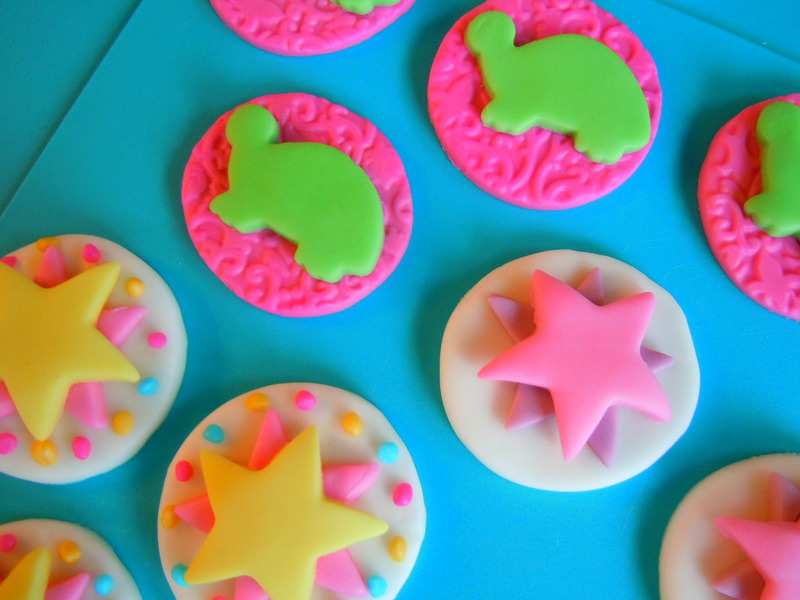 Nope, my mission was to design super bright, happy, cheerful, colourful toppers! There’s nothing like stumbling on a cute and cozy coffee shop on a wet and rainy day, especially when said coffee shop has flavoured hot chocolate! 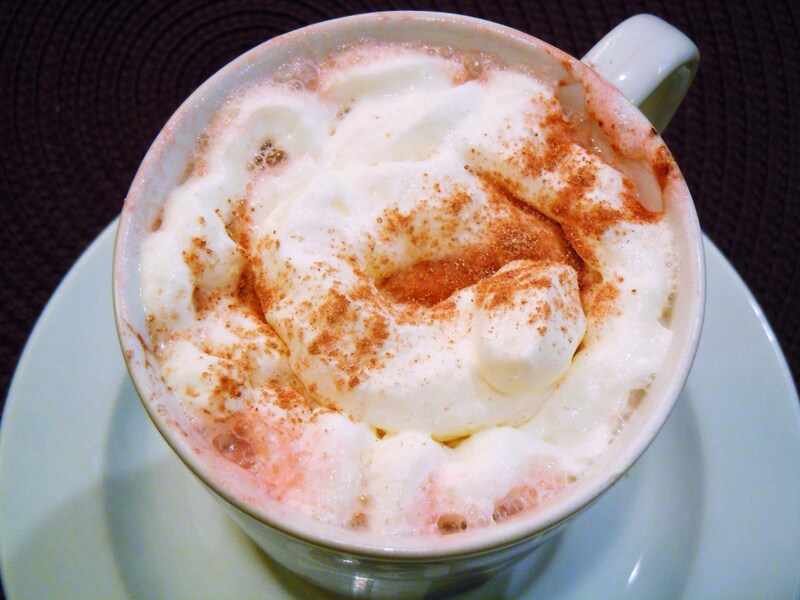 When I first came up with the idea of starting the Hot Chocolate Series, I admit, I envisioned falling snowflakes, mittened hands, and sun bouncing off sparkly white snow. I didn’t exactly anticipate walking around in slightly wet socks, and shaking excess water off my umbrella and dodging puddles in the middle of January. I’m not a fan of frostbite either, but let’s be honest, the not-so-winter-wonderland type of weather has put a damper on my wintry white hot chocolate fairy tale. Luckily for me, our beloved city has some very delicious hot chocolate to make up for that! 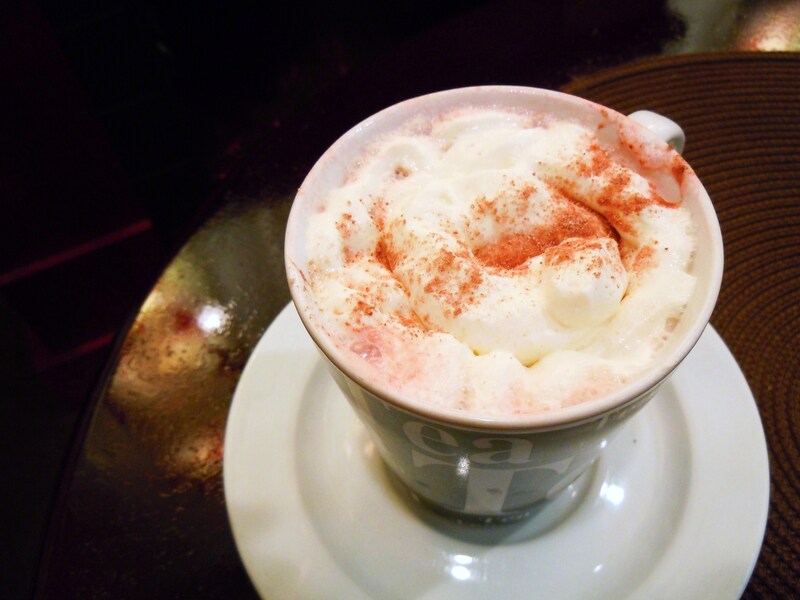 Introducing, the raspberry hot chocolate from Coffee Zone on Carlton Street! The first block on Carlton St. just off of Yonge has been developing into quite the foodie haven. The area may not be the haute couture of gourmet dining, but it does have its gems. First, we have The Sushi Shop on the south side of Carlton right beside the eastbound College subway station entrance and exit. Then we witnessed the partial transformation of Maple Leaf Gardens into the 80 000+ square feet* food and grocery mecca that is Loblaws late last year, complete with cheese wheel wall and designer cupcake wall. Finally, we bid farewll to 2011 and rang in 2012 with the opening of a brand new Bulk Barn store in December just a hop, step, skip away from the corner of Carlton and Yonge; bakers and cooks in the downtown core rejoice! Coffee Zone sits right in the middle of it all and for the life of me, I don’t know why I didn’t notice it before! I’ve been in and around the area countless times thanks to my many trips to Allan Gardens over the years and the cozy spot never even flitted across my field of vision. How embarrassing! Leave it to me to suddenly look up and see the hot chocolate menu board through the window on a random rainy winter day though! 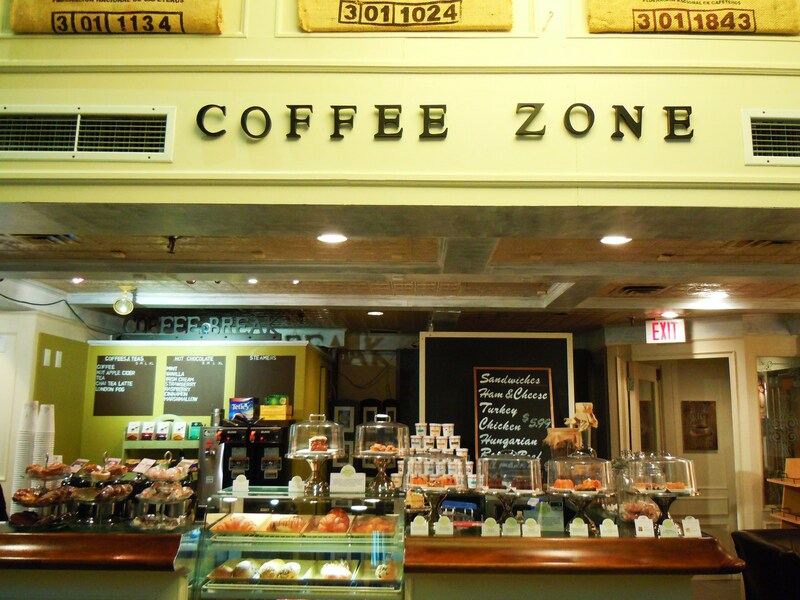 Coffee Zone is a comfy coffee shop and lunch cafe that serves sandwiches, desserts and pastries, and plenty of coffee, tea, and hot chocolate drinks. And I mean plenty! Aside from the hot apple ciders, london fogs, chai lattes, and cappuccinos, they have a slew of iced coffee drinks and flavoured cafe lattes. There are 10 – count ’em 10 – flavours of cafe lattes! Flavours include vanilla, cinnamon, chocolate, mint, strawberry, raspberry, irish cream, butterscotch, caramel, and hazelnut. Not only do they have 10 flavours of cafe lattes, they also have a number of different espresso drinks such as red eyes, single and double espressos, espresso macchiatos, and espresso con panna. The variety of drinks alone would make any coffee lover wiggle with glee. The cafe is open and spacious with huge windows looking out onto the street and the colours, furniture, and decor scream warm and welcoming. 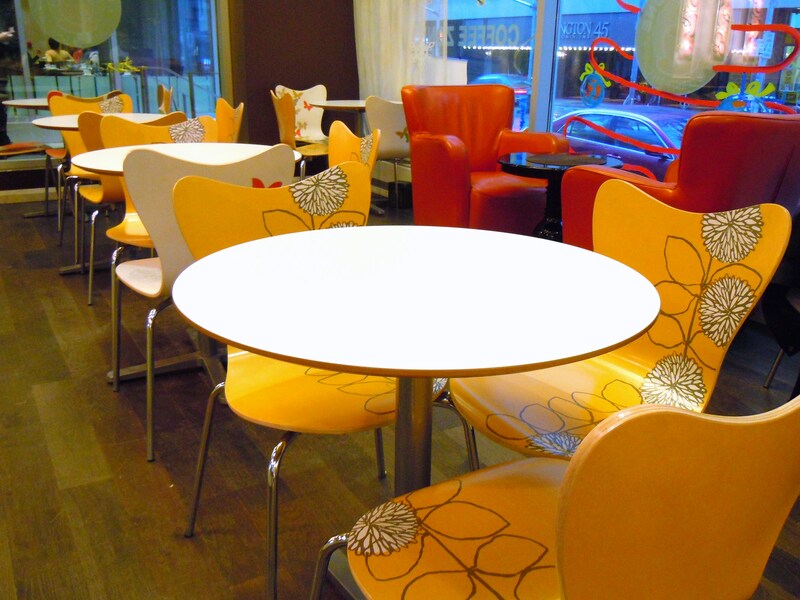 The chairs are painted in bright and cheery floral, butterfly, and polka dot prints, the walls are of a warm moss green, plushy armchairs and couches adorn both sides of the cafe, and a mini fireplace beckons you to curl up and enjoy a hot cocoa. 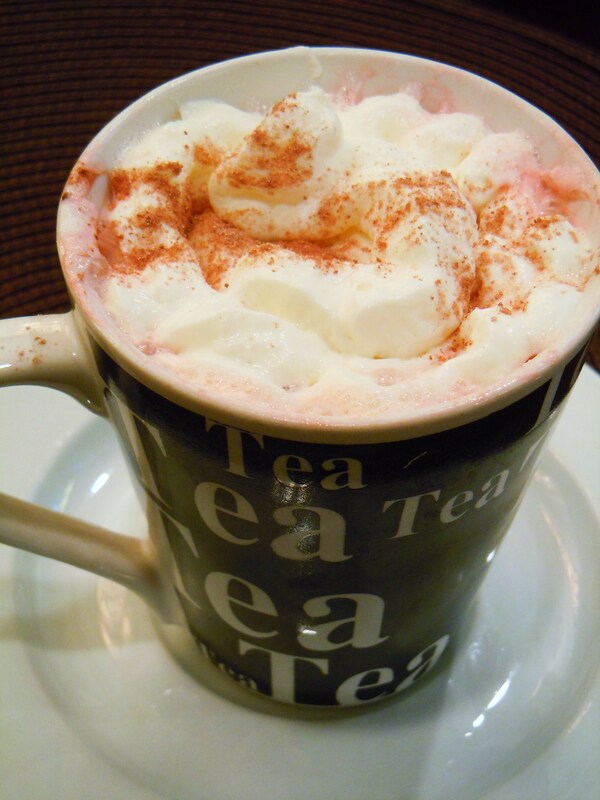 If you love flavoured hot chocolate, you will adore Coffee Zone’s hot chocolate menu. Much like the cafe latte selection, there are multiple flavours – and sizes – to choose from: mint, vanilla, irish cream, strawberry, raspberry, cinnamon, and marshmallow. A full menu of flavoured hot chocolate and comfy couches with a cute little fireplace? I was sold! I chose the raspberry hot chocolate ($2.49, small) and opted for a little bit of whipped cream on top at no extra charge. I plopped onto one of the squishy couches and made myself at home while I waited for my fruit hot chocolate and when it was ready, I was presented with the most adorable, fluffy, frothy raspberry hot chocolate! 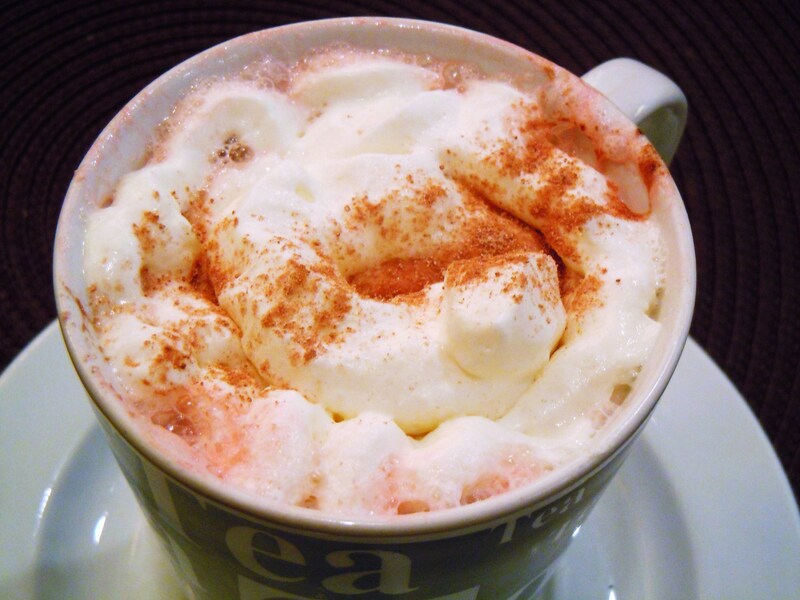 The whipped cream sat on top like a puffy cloud with powdered cocoa and frothy raspberry pink edges. It was like Jigglypuff wrapped in cotton candy, in hot chocolate form! It was fluffy and cute and it tasted delightful. The moment the whipped cream, hot chocolate, and raspberry flavour hit my tastebuds, I let out a happy, “Mmm, this is so good! !” The raspberry flavour was bang on and it was strong, in a good way. It didn’t overwhelm the chocolate but it was plenty strong and present enough for you to know the raspberry was there. With drinks, there’s nothing worse than ordering a flavoured one only to taste it and be disappointed by the complete lack of flavour. It was fruity and sweet and the flavour was unmistakeable. The hot chocolate wasn’t scalding (thank god) and the whipped cream didn’t melt away and disappear which I really appreciated. If I had to give it a fixer-upper, I would make it just a touch thicker, but other than that it was beyond delicious. I couldn’t believe the coffee shop, with its huge menu of drinks, had been under my nose all this time and I’m very much looking forward to trying a few other flavours of hot chocolate. Thanks to my realization, that wet and rainy day proved to be a great day after all. 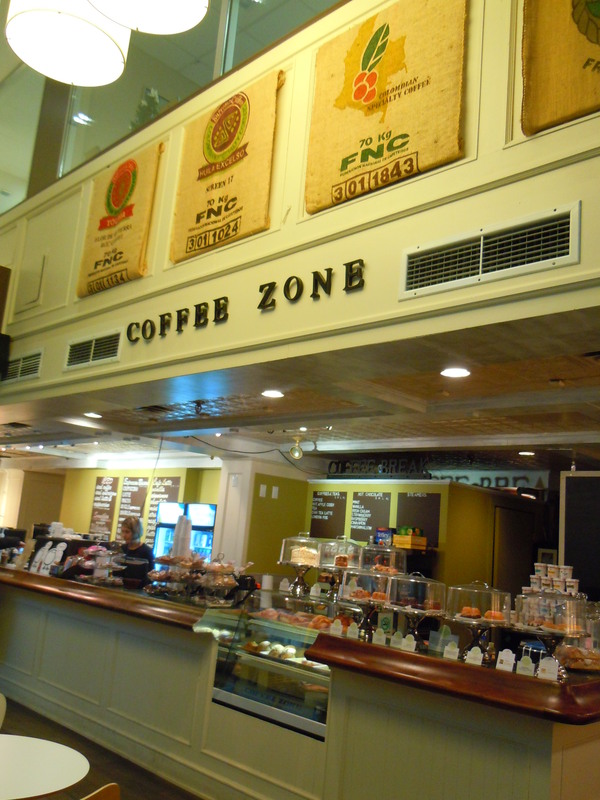 Coffee Zone is located at 30 Carlton St., just east of Yonge on the north side of Carlton. It is steps away from College subway station and sits just west of the new Loblaws in old Maple Leaf Gardens.